At Pinnacle Innovations we take a "Total Systems Approach" with every project to make sure that all variables are identified so that we can design the correct system for you the first time. Normally this involves a little information gathering and sharing during the first few communications. 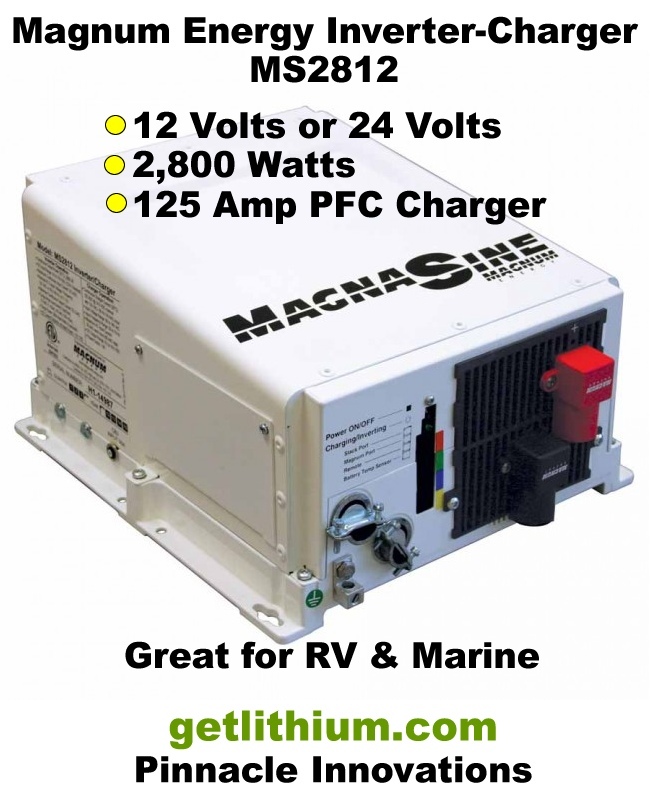 All of your existing equipment - both AC (120 Volt or 240 Volt Alternating Current) and DC (12 Volt or 24 Volt Direct Current) devices as well as their Amp draws/ charging capabilities. In addition, we determine for how many hours each day these devices are used so that we can come up with a "Power Inventory" for both Charging Devices as well as Load Devices. We aim to work with and reprogram existing charging equipment whenever possible to be compatible with lithium-ion battery charging requirements - we don't want you to have to buy replacement parts if we can reprogram your existing charging equipment. The physical dimensions of compartments that you wish to locate new equipment such as the Lithionics batteries, inverter-chargers and so on. This helps us make drawings to see what size(s) of batteries etc. will fit in the most economical way. As part of this process we also look at power cabling distances to optimize efficiency and minimize DC power cable costs. 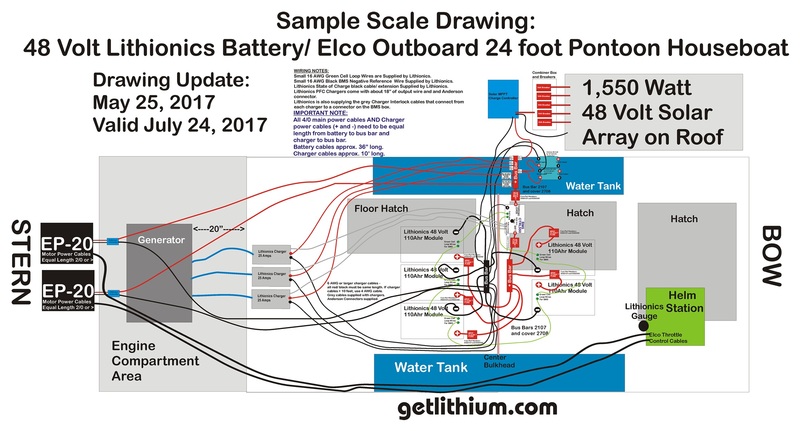 Sample marine installation wiring diagram with Lithionics 12 and 24 Volt battery banks as specified by Client, 24 Volt Victron 3kW inverter-charger, DC Power Solutions high output alternator upgrade, Polar Power 8kW DC diesel generator, Perfect Switch POWER-GATE rectifier isolators and ORing relays, Solbian solar panel array with 1,000 Watts of power. 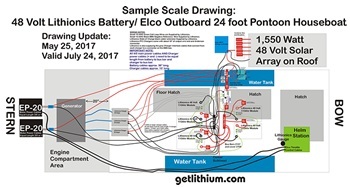 Click on the above Sample Wiring Diagram for details of this 48 Volt Lithionics lithium-ion battery system with twin Elco EP-20 48 Volt electric marine engines on a 24 foot pontoon houseboat. Your desired operation of the system. This is sometimes referred to as the "Duty Cycle" - for how long you want to be able to power the equipment before the need for recharging. From this we analyze the battery bank size needed as well as recharging options and their output. 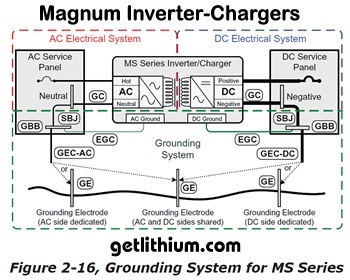 Wherever possible, we try to maximize what we call "Opportunity Charging" where equipment like alternators or solar panels can be recharging the battery bank whenever possible to minimize the battery system depth of discharge and keep your battery system topped up. From this, we can create some drawings as well as wiring diagrams, specify components needed and come up with a quote for you. In many cases we can also provide installation or installation support - we have travelled to Taiwan, Florida and other locations to assist clients with on-site support, testing and installations. 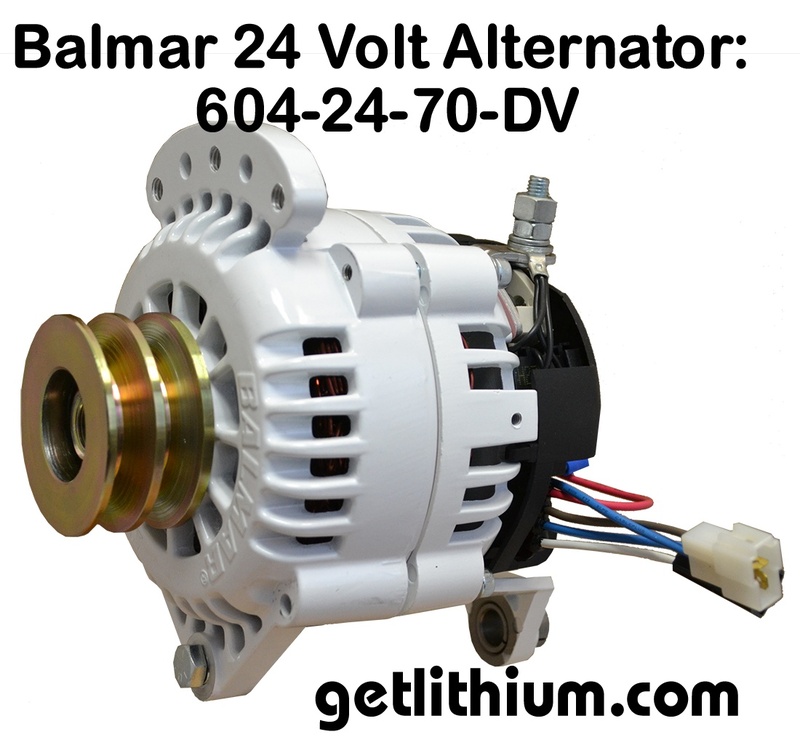 We offer alternator upgrades including Balmar, Nations and DC Power Solutions. 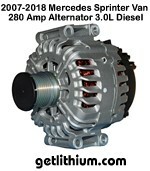 Alternators up to 350 Amps of output with 180+ Amps output at idle. Available as single OEM alternator replacements or custom dual alternator upgrades. 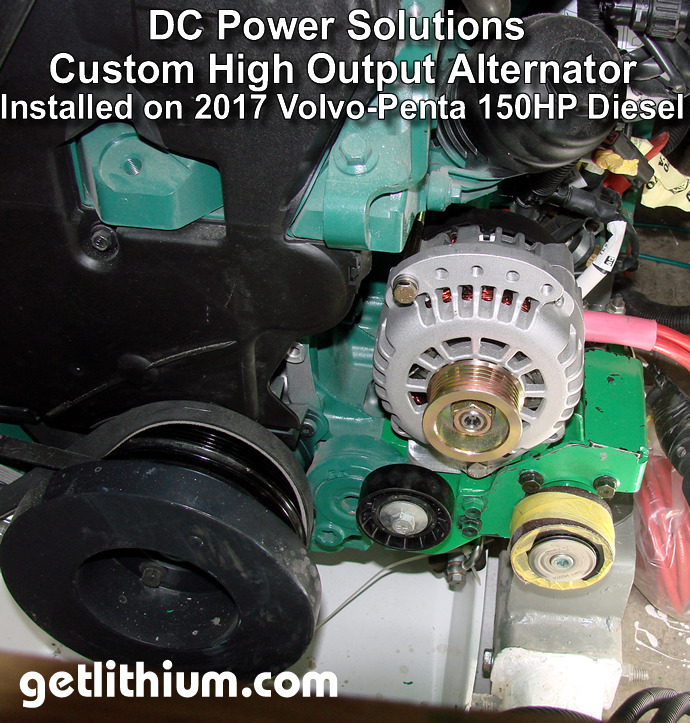 In general, for most applications, a high output alternator upgrade is going to start around $700.00 USD and go up from there. Get in touch with us at Pinnacle Innovations to get you the right solution at the right price. 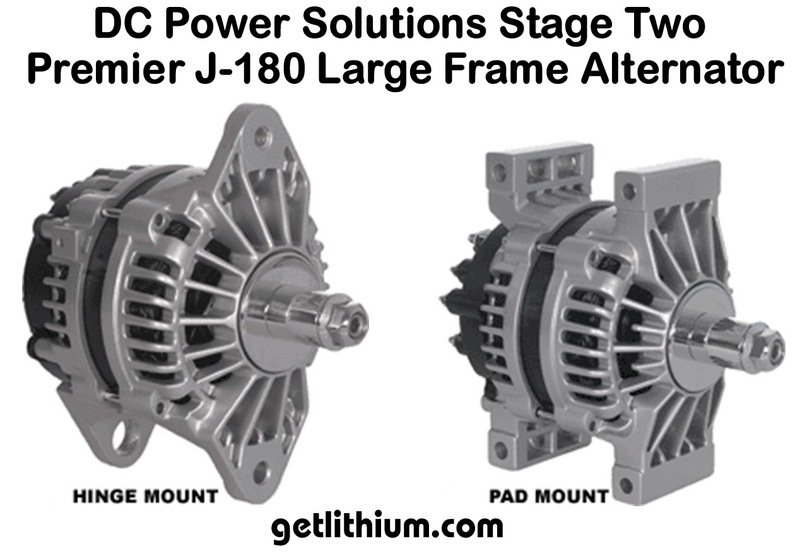 A big part of any alternator upgrade is a system analysis that inludes reviewing cabling capacity and battery isolators that may be involved. 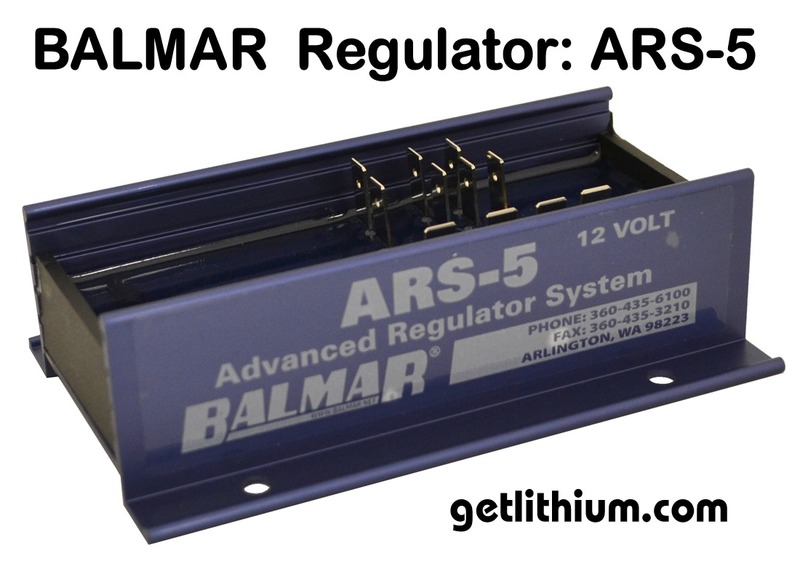 In most cases, existing solenoid style battery isolators will not only prove inefficient but will not be able to handle the indreased Amps going through them. The best way to upgrade these is with a Perfect Switch POWER-GATE battery isolator. Pinnacle Innovations has worked closely with Perfect Switch Enginneers to come up with some creative, simple and safe engineering solutions on some of our custom projects. 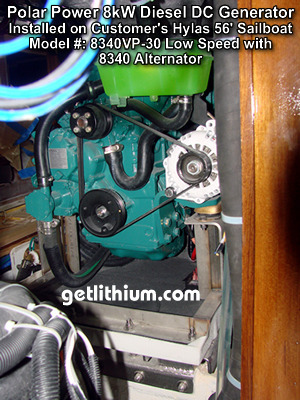 Whether you have a diesel marine engine or a gas RV engine, chances are that we are able to offer either a replacement alternator or even a dual alternator upgrade soultion. 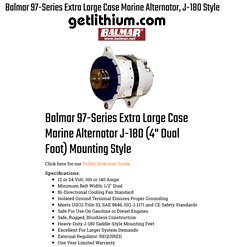 Balmar and Nations offer several models that fit most popular diesel and gas engines. 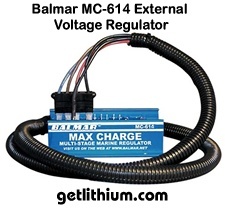 One thing we always look at with alternator upgrades is whether or not we can utilize an external Voltage Regulator - like the Balmar MC-614 external Voltage regulator. 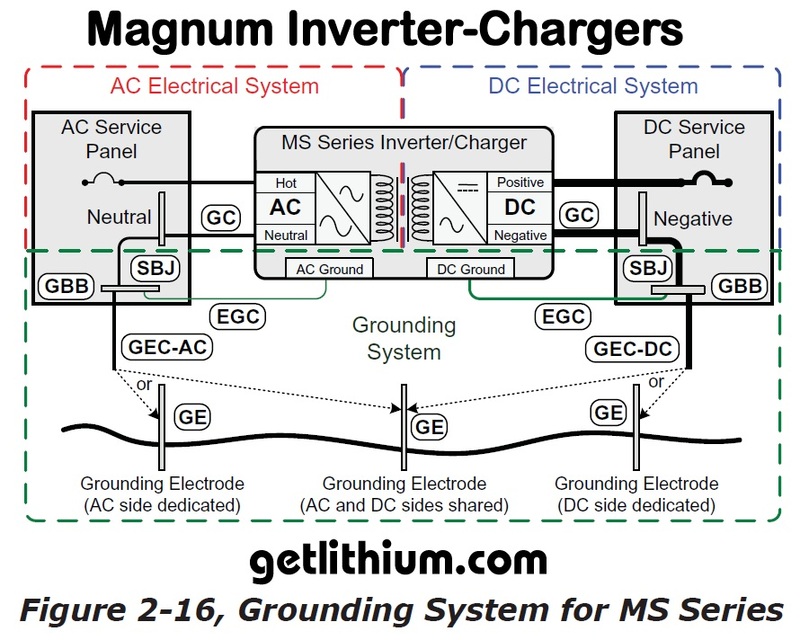 One of the main advantages of this is that we remove the regulatoir from the heat-susceptible alternator so efficiency gains and charging Amps can be greater. 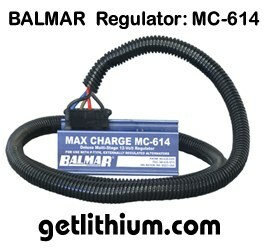 Balmar MC-614 external Voltage regulator for high output marine and RV alternators (see details below). We can also provide customers with upgraded copper power cabling. Most often we use Ancor 4/0 and smaller marine rated/ ABYC certified power cabling with 105 Celsius conduit ratings. 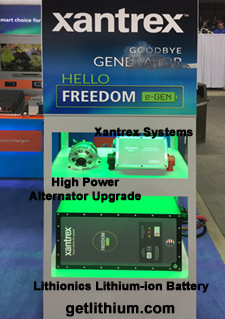 Lithionics Battery has worked dilligently with several respected and leading Inverter-Charger Manufacturers including Xantrex, Magnum Energy, OutBack Power, Victron Energy and more to understand their product and develop optimal firmware and software upgrades to optimize their charge algorithms for the Lithionics lithium-ion battery systems and NeverDie BMS. 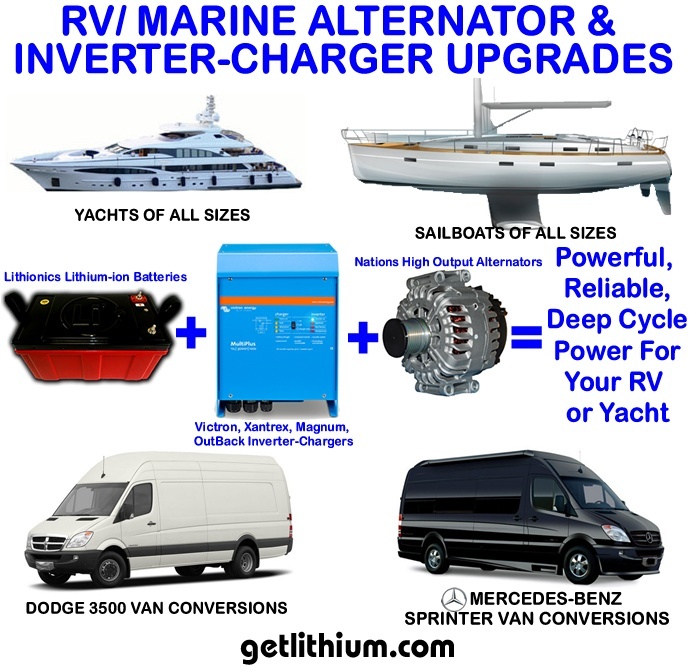 Whether you have an RV, yacht, sailboat or Mercedes-Benz Sprinter van conversion, we can assist you in selecting the right inverter-charger, inverter or DC power converter for you. 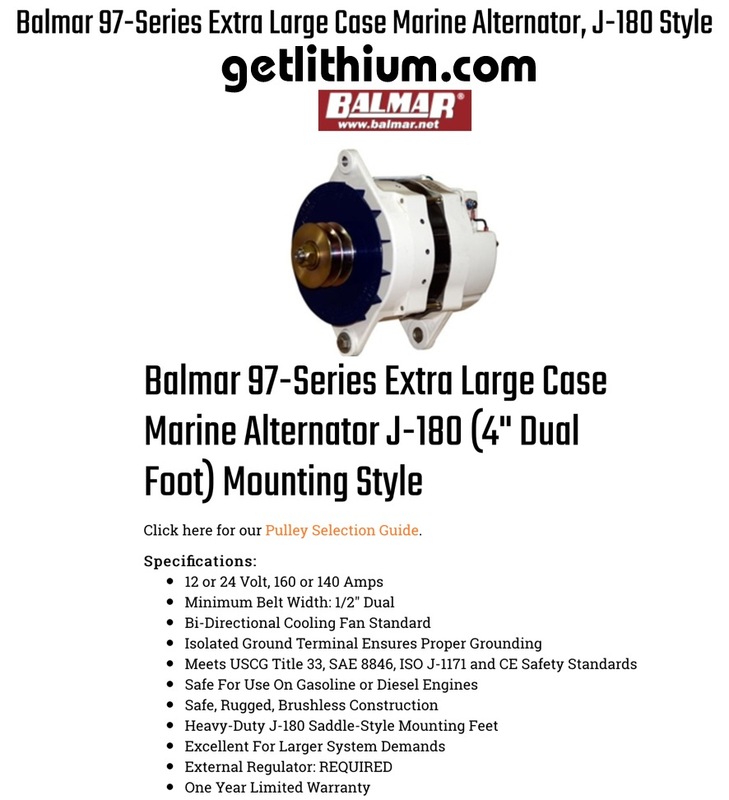 We offer a complete line of Balmar products (over 50) so if you don't see what you need, just call 778-340-0060 or email us. 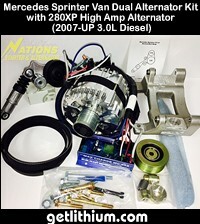 Kits include: alternator, ARS-5 regulator, alternator/battery temperature sensors and hardware kit. 12 Volts with 120 Amps output. 24 Volts with 70 Amps output. 24 Volts with 70 Amps output. 4" Dual Foot Saddle Mount (J-180-style). External Voltage Regulator parts sold separately. 12 Volts with 210 Amps output. 4" Dual Foot Saddle Mount (J-180-style). 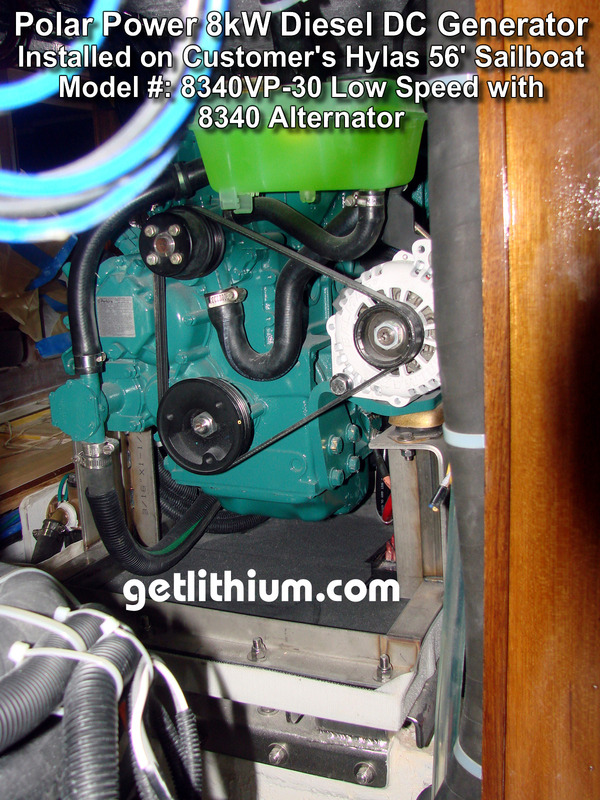 This is a large case alternator so please check your engine room to ensure you have room for this alternator. Large frame alternators designed for mid-duty cycle applications. 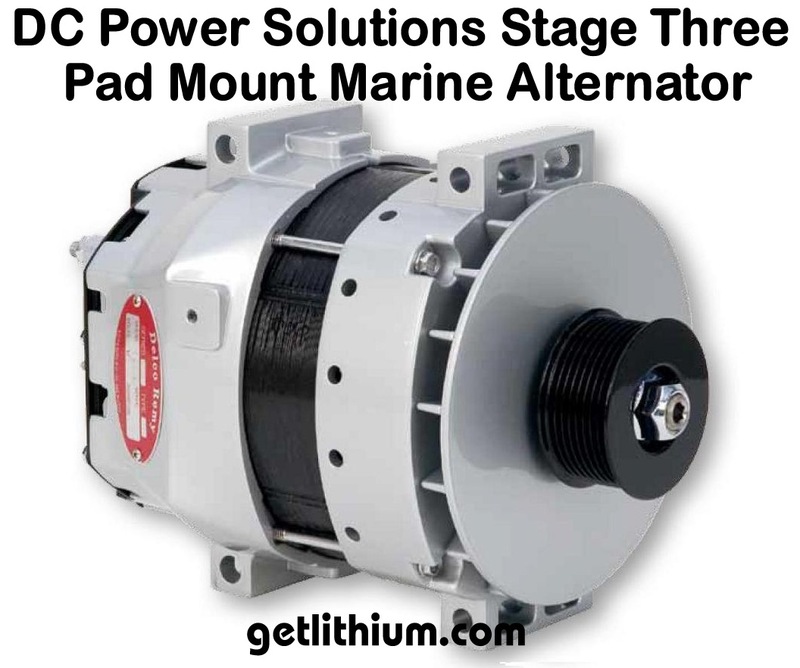 From world class ocean racers to commercial fishers and military patrol vessels, these large-frame alternators have a proven record for supporting large house battery banks and challenging electrical loads under some of the toughest marine conditions imaginable. 94-Series, 94LY-Series and 95-Series Alternators feature extra-large gauge custom wound stators and high Amperage diode packs to ensure optimal charging performance. 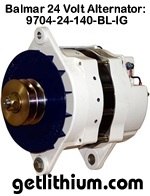 94-Series alternators deliver excellent low RPM output and terrific response throughout the power band. * Serpentine Pulley Mounted on Request. Part number 48-AM-39 with 2.7" diameter, 0.875" bore and 10 groove (J10) channel for serpentine belts. 24 Volts with 140 Amps output. 4" Dual Foot Saddle Mount (J-180-style). This is a large case alternator so please check your engine room to ensure you have room for this alternator. 24 Volts with 140 Amps output. 4" Dual Foot Saddle Mount (J-180-style). Built expressly for the added demands of large multi-battery banks, inverter loads and other substantial electrical demands, Extra-Large Case 97-Series Brushless Alternators provide the size, cooling and output across the range of engine RPM required to perform in league with a small genset. 24 Volts with 140Amps output. 4" Dual Foot Saddle Mount (J-180-style). 12 Volts with 310 Amps output. Built to provide performance in a league with an auxiliary genset, this alternator can deliver up to 5KW. 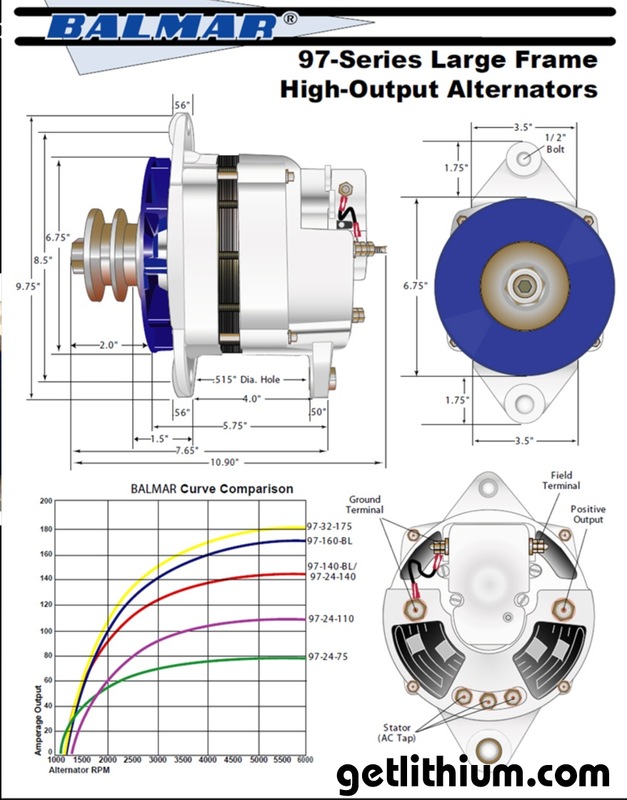 This extra large case alternator features a brushless design which eliminates a critical wear point, increases ignition protection and delivers greater field efficiency. Includes a 4" J-180 saddle-style mount. Dual cooling fans help insure cooler operation. Isolated ground for installation on steel or aluminium boats. 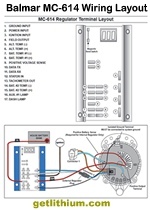 Meets USCG Title 33, CE, SAE 8846 and ISO J-1171 ignition protection requirements. 24 Volts with 220 Amps output. The most advanced regulator available! 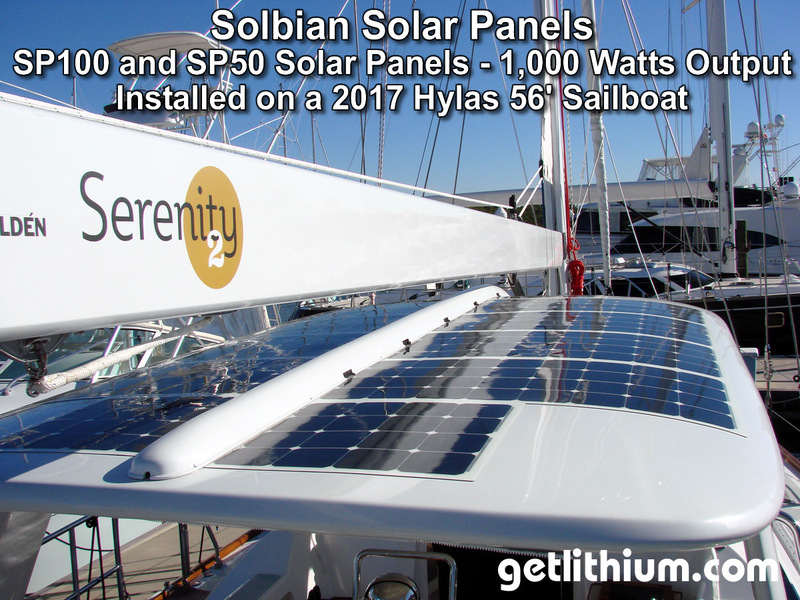 Typically, more than 70% of the energy put into battery banks is generated while away from the dock. That's why it's essential to control your engine's alternator with the smartest, most powerful Voltage regulator available. 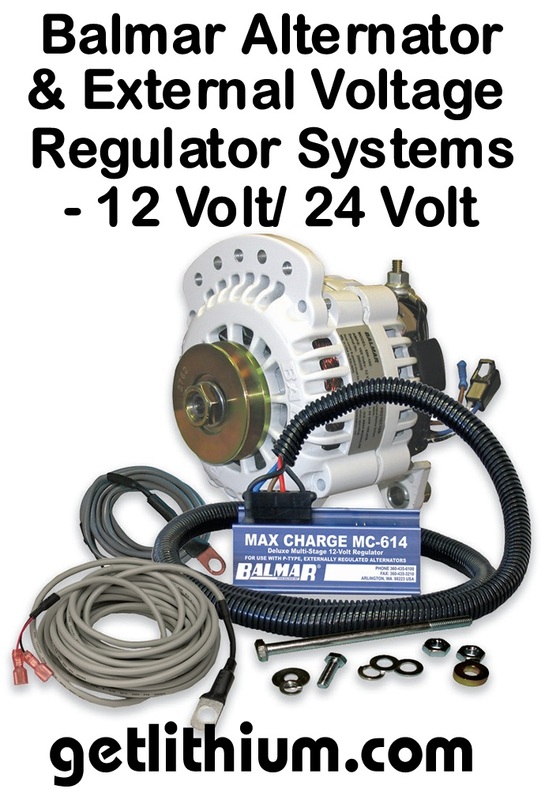 12 Volt and 24 Volt Max Charge regulators provide the ultimate combination of programmability and built-in charging intelligence to keep your batteries at their best. 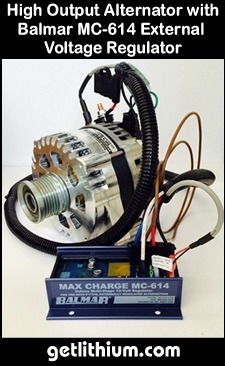 Add the benefits of automatic alternator and battery temperature sensing (optional sensors MC-TS-A and MC-TS-B are required) for even greater safety and control. Important Note: Alternators output higher Amps and Voltage in cooler temperatures. 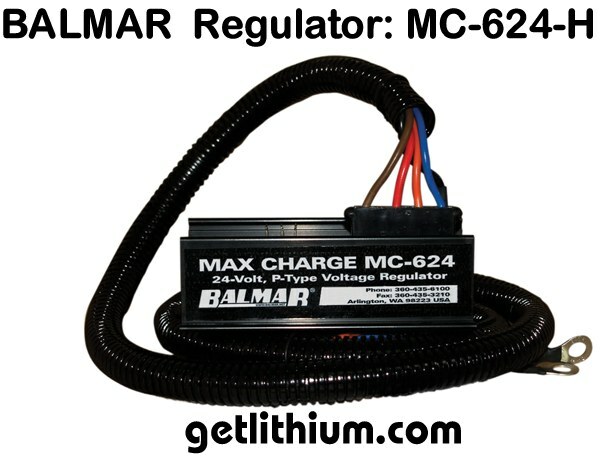 When connecting the Balmar MC-614 external Voltage regulator to Lithionics lithium-ion batteries, if the outside temperature is say 22 Celsius or higher, we recommend setting the Voltage a little below the Lithionics maximum charging Voltage by a few percentage points. Charge 14.4 Volts - 14.6 Volts. 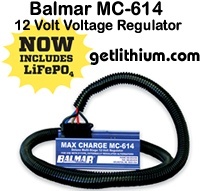 On newer Balmar External Voltage Regulators, they do have a "Lithium-ion Battery" charge setting, which is acceptable for the Lithionics lithium-ion batteries. 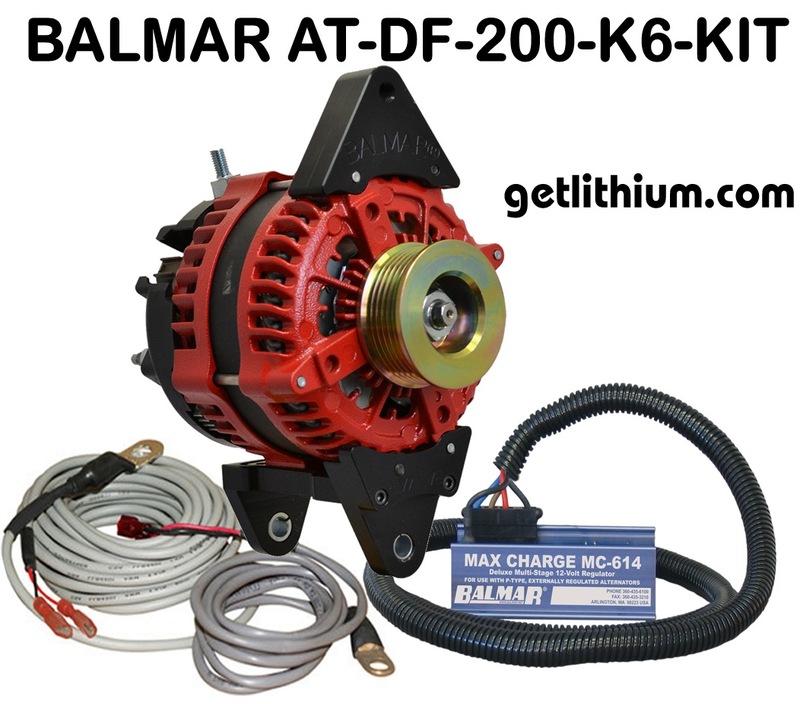 Balmar suggest setting the alternator temperature to 90 degrees Fahrenheit. 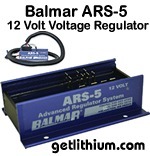 We often use the Balmar External Voltage Regulators with high output alternators that we can tie in to the NeverDie BMS option called FCC (Field Circuit Control). 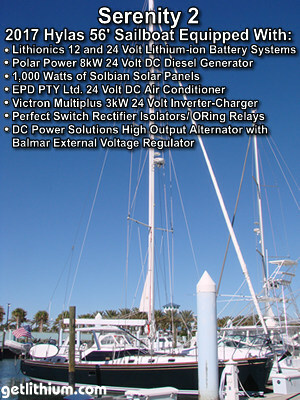 Click on the images to see the Balmar instruction manual. 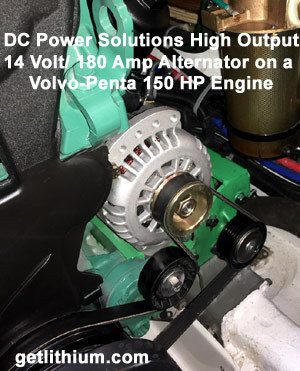 Please consult us about what Voltage it should be set at as alternators output higher Voltages when cold. 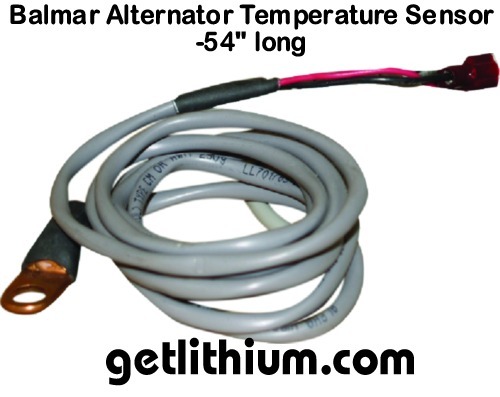 Important Note: Alternators output higher Amps and Voltage in cooler temperatures. 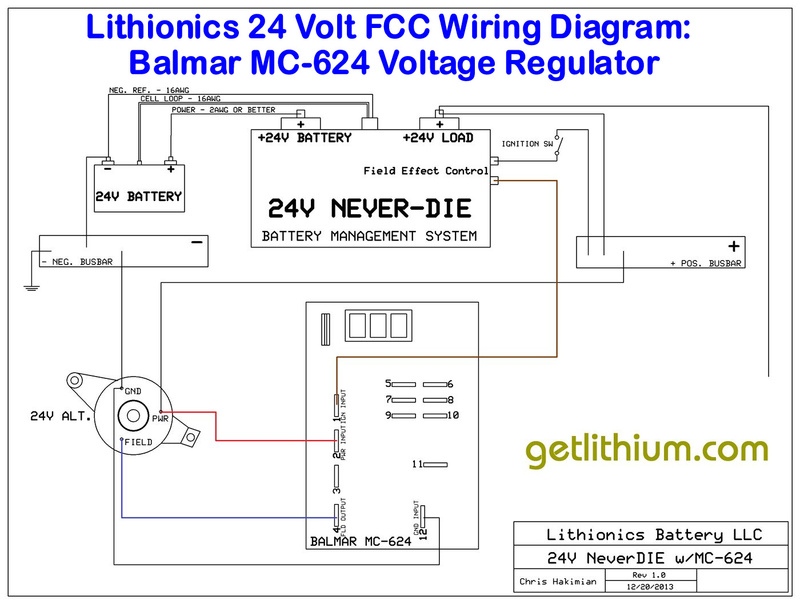 When connecting the Balmar MC-624 external Voltage regulator to Lithionics lithium-ion batteries, if the outside temperature is say 22 Celsius or higher, we recommend setting the Voltage a little below the Lithionics maximum charging Voltage by a few percentage points. Charge 28.8 Volts - 29.2 Volts. When installing this device on a high performance alternator that uses an external Voltage Regulator like the Balmar MC-614 or MC-624-H and a Perfect Switch POWER-GATE Dual Battery Isolator, we may need to connect the external Voltage Regulator's "Battery +" wire to the engine starting battery's positive post or to the "Main Battery" stud post on the Perfect Switch instead of the "Battery Positive + Post" on the alternator. 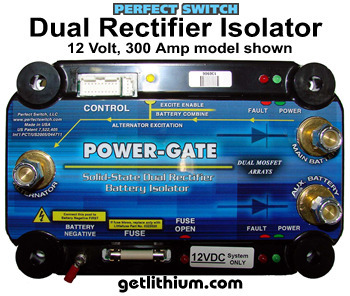 The reason is that with the Perfect Switch dual isolator installed, the alternator's "Battery Positive + Post" does not have power until the Perfect Switch device is active and as a result the Voltage Regulator may not turn on as desired when cranking the engine. If possible, we recommend bench testing the alternator/ batteries and Perfect Switch system prior to installing on the vehicle. 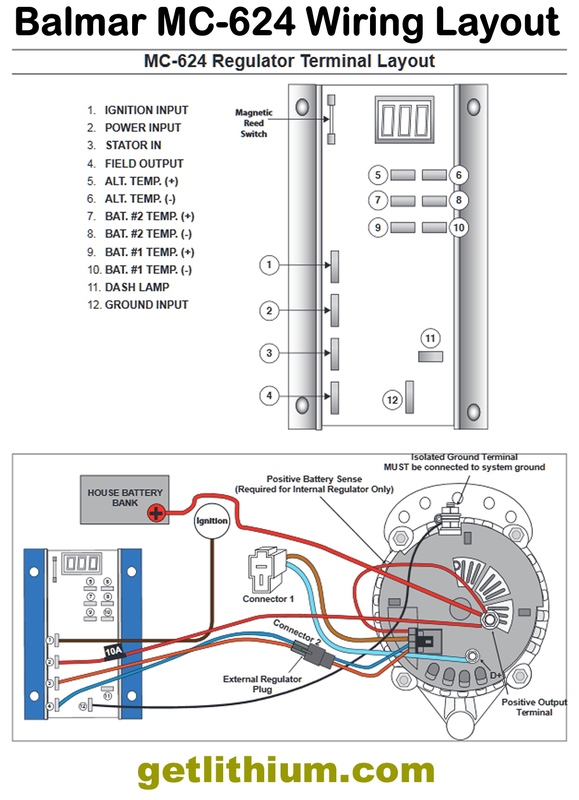 The best way is to follow the Alternator/ external Voltage Regulator's Installation Instructions but if the Regulator does not power up then try using this alternate wiring option of the Regulator's "B+" or "Battery Positive +" wire. Part Number with Harness: ARS-5-H. Important Note: Alternators output higher Amps and Voltage in cooler temperatures. 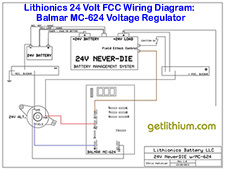 When connecting the Balmar ARS-5 external Voltage regulator to Lithionics lithium-ion batteries, if the outside temperature is say 22 Celsius or higher, we recommend setting the Voltage a little below the Lithionics maximum charging Voltage by a few percentage points. When installing this device on a high performance alternator that uses an external Voltage Regulator like the Balmar ARS-5, MC-614 or MC-624-H and a Perfect Switch POWER-GATE Dual Battery Isolator, we may need to connect the external Voltage Regulator's "Battery +" wire to the engine starting battery's positive post or to the "Main Battery" stud post on the Perfect Switch instead of the "Battery Positive + Post" on the alternator. 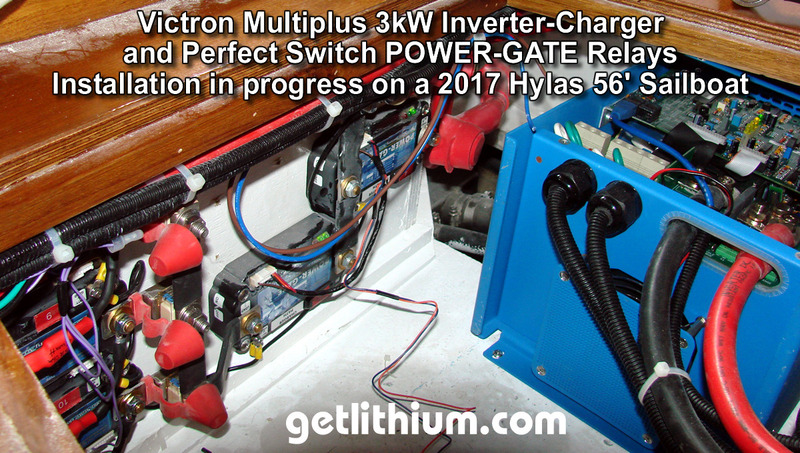 The reason is that with the Perfect Switch dual isolator installed, the alternator's "Battery Positive + Post" does not have power until the Perfect Switch device is active and as a result the Voltage Regulator may not turn on as desired when cranking the engine. If possible, we recommend bench testing the alternator/ batteries and Perfect Switch system prior to installing on the vehicle. 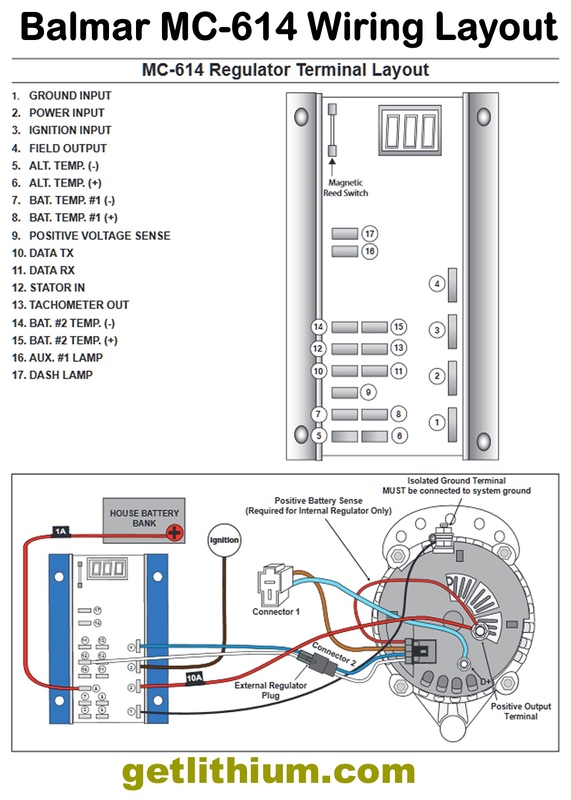 The best way is to follow the Alternator/ external Voltage Regulator's Installation Instructions but if the Regulator does not power up then try using this alternate wiring option of the Regulator's "B+" or "Battery Positive +" wire. 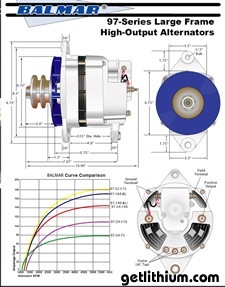 Many installers rely on the Universal Adjustment Arm (UAA) for alternator installations. Precision cut and powdercoated for protection from rust and corrosion. Universal Adjustment Arm for the Belt Buddy. This part number is for the "Arm Only". It does not come with the Belt Buddy Adjustment Mechanism. The Belt Buddy Mechanism which goes with the UAA is part number BB, grouped together the set is part number UBB. The Belt Buddy Mechanism which goes with most any adjustment arm is part number BBU. The UAA is 10.3" long and the adjustment slot provides up to 4.5" of travel. The adjustment slot is 0.53" wide. 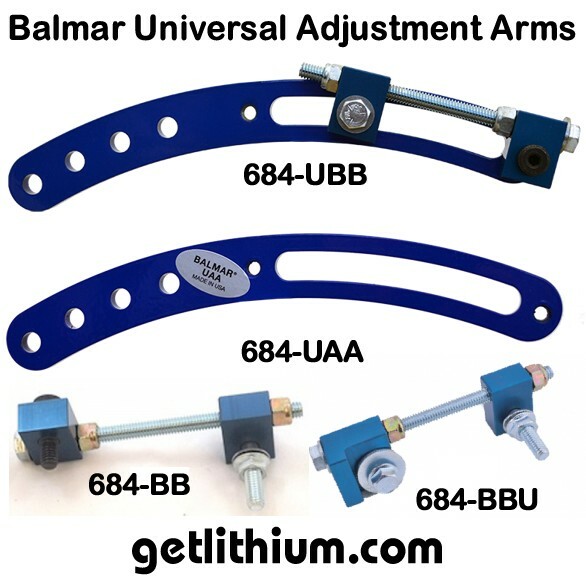 This is the complete assembly (UBB =UAA + BB), designed for adjusting belt tension and providing a positive stop for no slipping. Includes the Belt Buddy draw clamp. Belt Buddy Kit: Includes the Universal Adjustment Arm (UAA) and Belt Buddy Mechanism (BB). 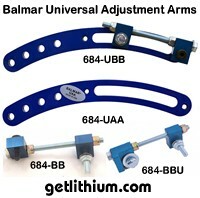 To utilize only the adjustment mechanism with an existing adjustment arm, purchase part number BBU. Caution: This approach sacrifices some "travel" in the existing adjustment arm so the BBU mechanism can be anchored to the arm. 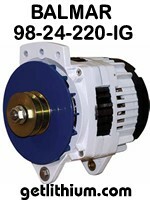 Make certain your alternator mounting does not need this travel before purchasing the BBU. 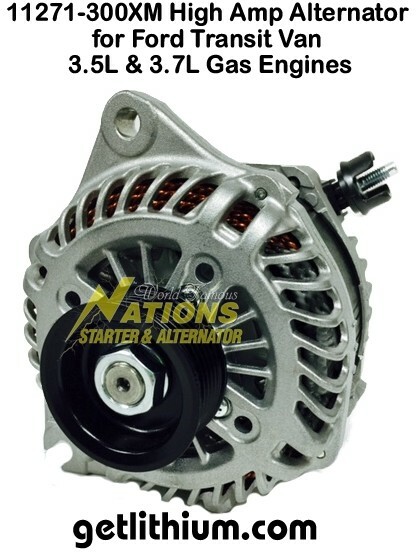 We offer the complete line of Nations Alternator products so if you don't see what you need, just call 778-340-0060 or email us. Shown below are just a few of the more popular models for Van Conversions. The XP Series high-output alternators are designed for incredible durability and performance under any circumstance. 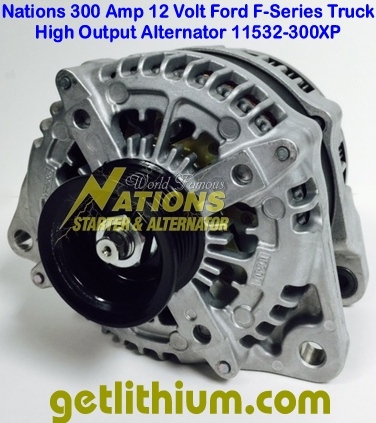 Before releasing to the general public, Nations has put the 270 Amp XP series alternator through vigorous testing on the 3.6L V6 Pentastar engine to ensure that they hold up to our strict standards. 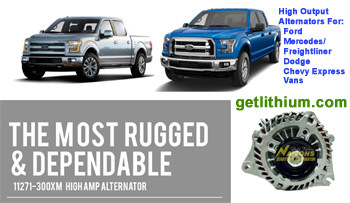 All of our alternators come standard with our 2-year warranty. If you're looking for a significant overall increase in top end and idle output, the XP series alternator is your solution to your needs. 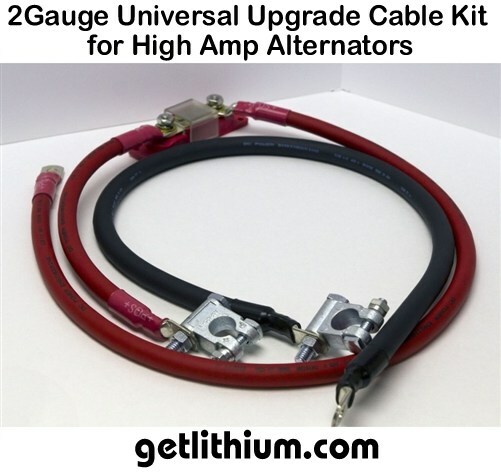 2/0 cable kit upgrade available - add $90.00 USD. 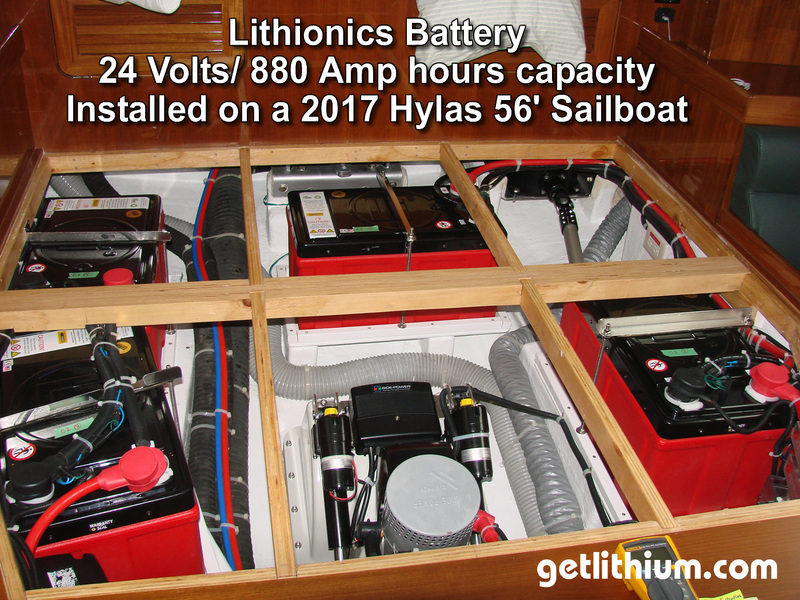 Lithionics has worked with IVS to develop an approved method of using the OEM alternator with a Lithionics lithium-ion battery system. 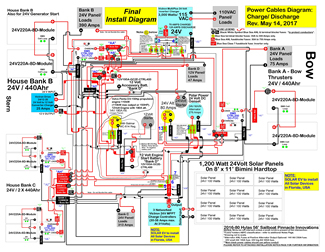 This requires the purchase and installation of a Mastervolt "Charge Mate Pro 40". 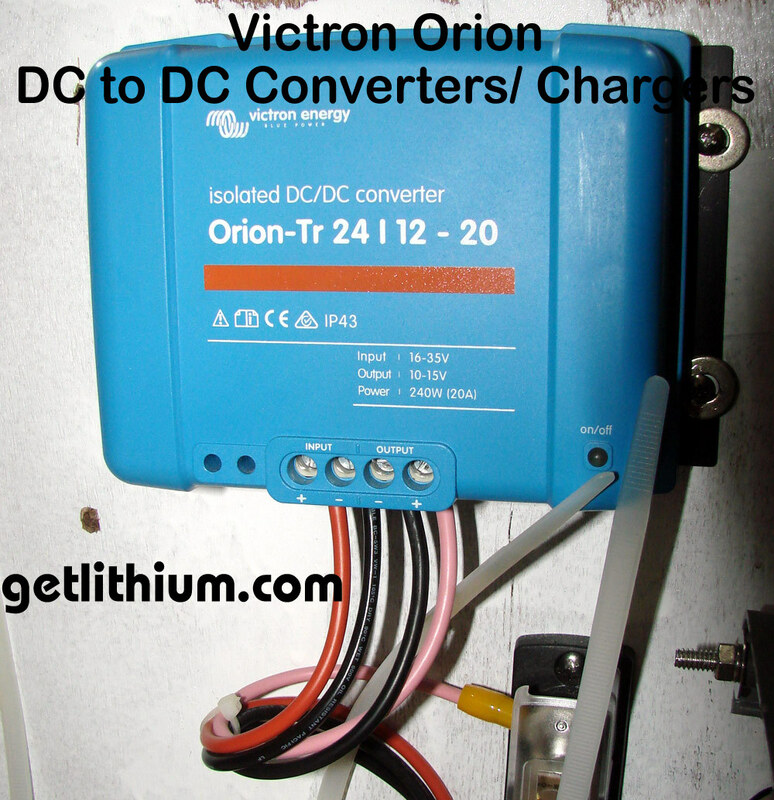 Failure to use this device can cause the alternator to fail prematurely and/ or create problems of overcharging the Lithionics lithium-ion battery that will trigger the HVC (High Voltage Cutoff) function of the BMS to turn off the battery power. Please click on the PDF image to get the installation instruction sheet. 280 Amp Sprinter Alternator Fits 2007-On Vehicles with 3.0L Mercedes Diesel. 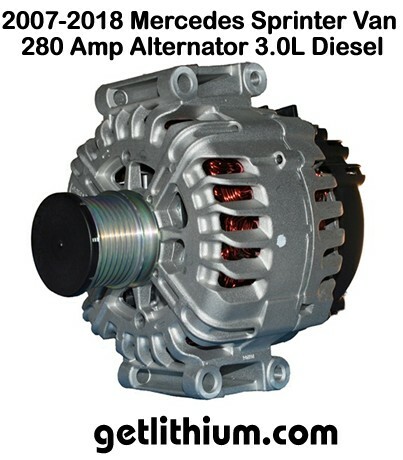 This Alternator is the solution to the underpowered electrical sytem for Sprinter Vans needing more power through all rpm ranges. This durable unit is a direct fit and computer compatible. 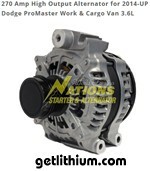 The most powerful Sprinter Van Alternator available from Nations. What if you had a separate charging system dedicated to the additional accessory load? 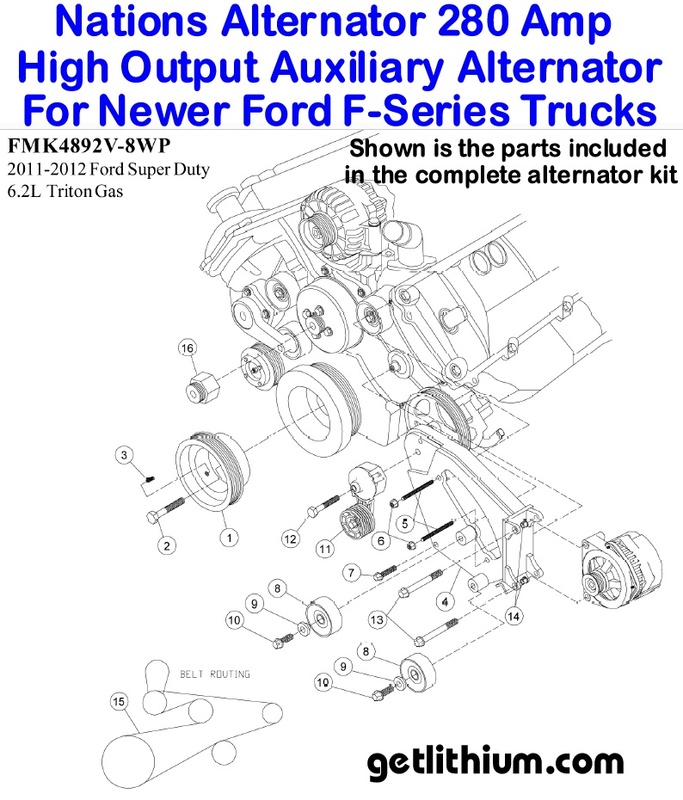 By running dual alternators you can do just such a thing, and doing so leaves the factory charging system intact doing what it was intended to do, running the vehicle while the secondary alternator carries the additional accessory load. By effectively doubling the available amperage of the vehicle, you can run more accessories with less worry and all for about the same cost as a single high quality High Output alternator. 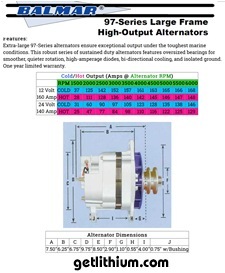 We are very proud to say, this dual alternator kit is 100% designed and manufactured in the USA! 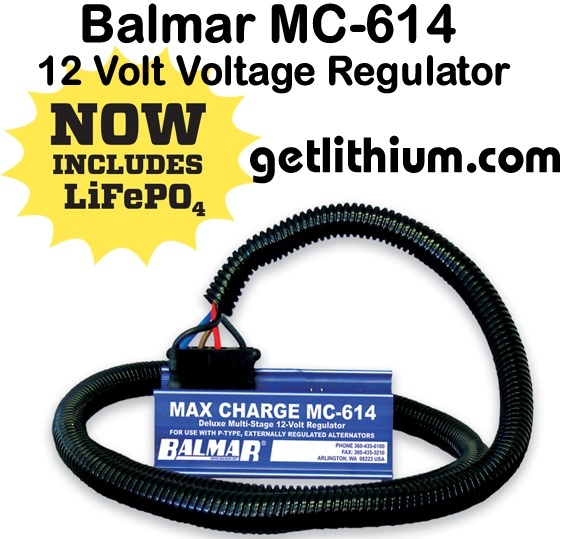 You can add a Balmar MC-614 External Voltage Regulator to your package to gain more optimal performance. 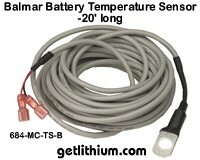 Note: If you are using Lithium Batteries, this is a requirement. 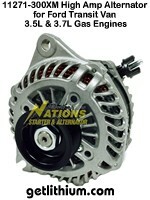 MC-614 price when ordered with Nations alternator: $399.95 USD. 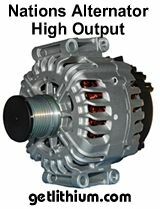 The Large Case Denso Hairpin 300 Amp XM series high output alternator is a component of a next generation high efficiency, severe duty charging system specifically engineered for Nations Starter and Alternator. 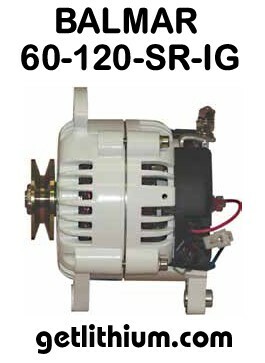 This system consists of a 300 Amp alternator and internal regulator. 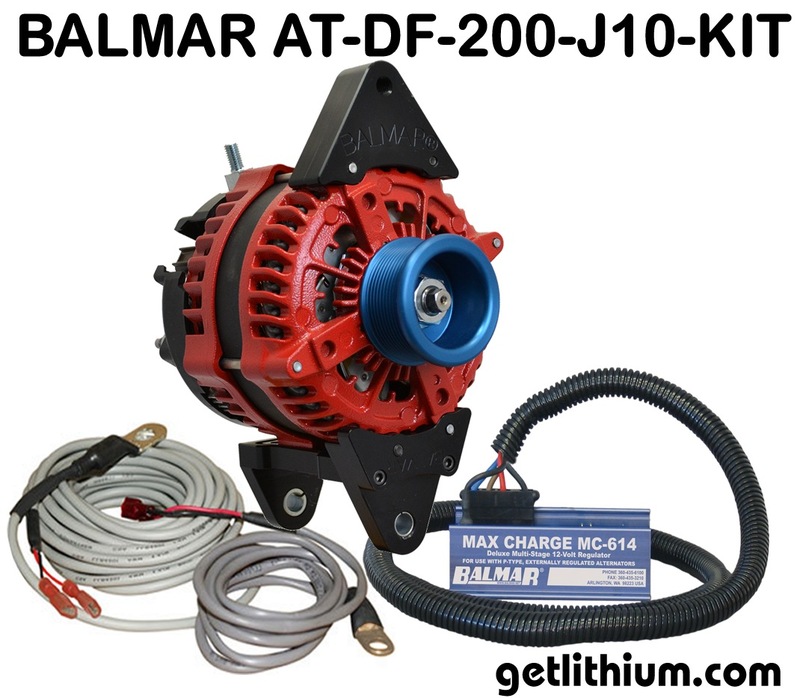 The alternator produces a maximum of 300 Amps and will produce a minimum of 170 Amps continually at low idle speeds and maximum output above 1800 engine RPM. The alternator has a maximum efficiency in excess of 75 percent. 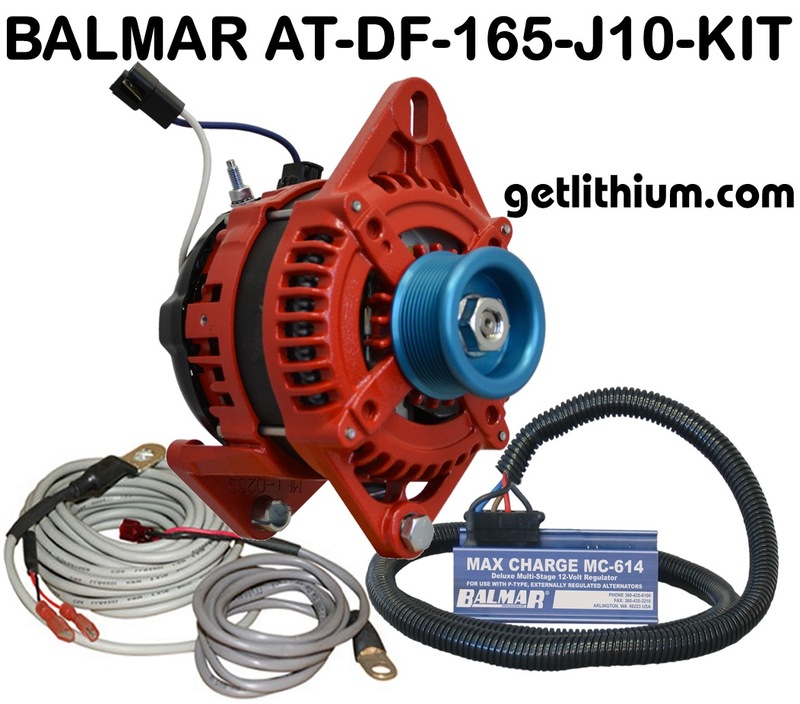 The rectifier is mounted onboard the alternator and consists of 12 50 Amp press fit diodes. The brush holder assembly and slip ring are environmentally protected and the bearings are heavy-duty, oversized premium bearings. 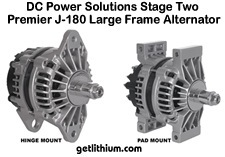 The alternator housings are precision-machined cast aluminum and all components are of OEM quality. All major components being carefully chosen for maximum performance and reliability. 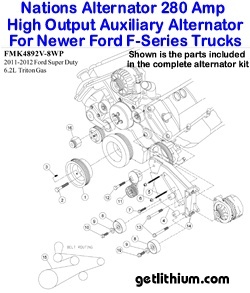 The Large Case Denso Hairpin 300 Amp XM series alternator is specially designed to mount directly in the OEM mounting location with no modification. All electrical connections shall be in the original locations. 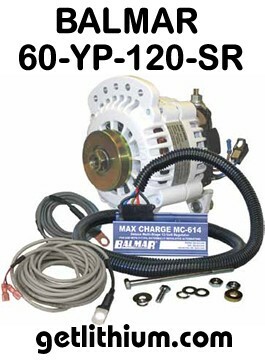 The alternator features a custom machined drive pulley for increased output at idle speeds and retains OEM belt length. The pulley is 6 Groove Hard Anodized 6061 Billet Aluminum and hard anodized coating for wear resistance and durability. Outputs 190 Amps at idle. Powdercoat or anodized colour options available at extra cost. This is one of Nations Alternator's latest high output alternator upgrades for Ford F-Series trucks - such as the 2018 F350 with 6.2 liter gas engine. 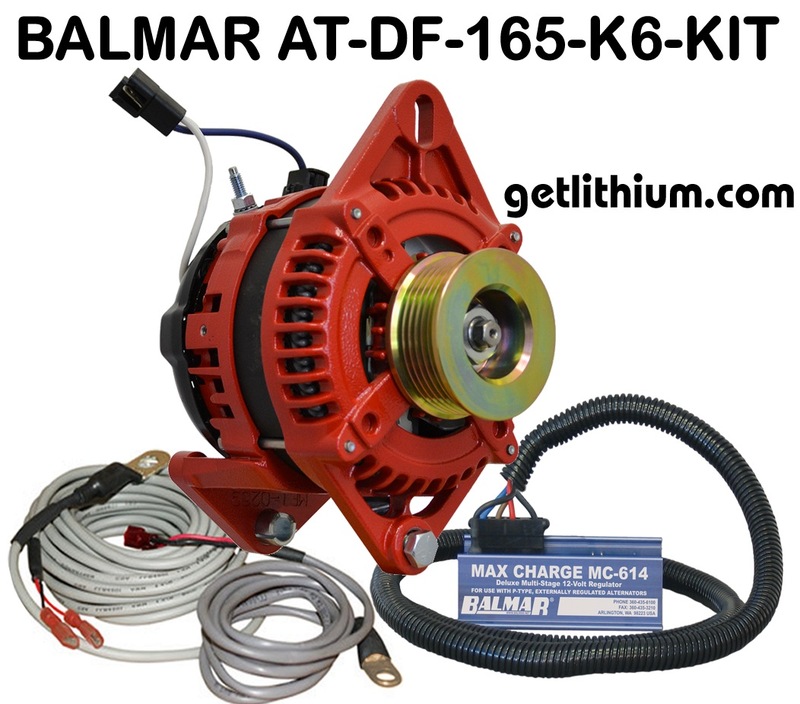 Everything that you need is included in this kit including the brackets, new water pump, pulleys and of course the 280 Amp high output XP second alternator, Balmar MC614 external Voltage regulator etc. 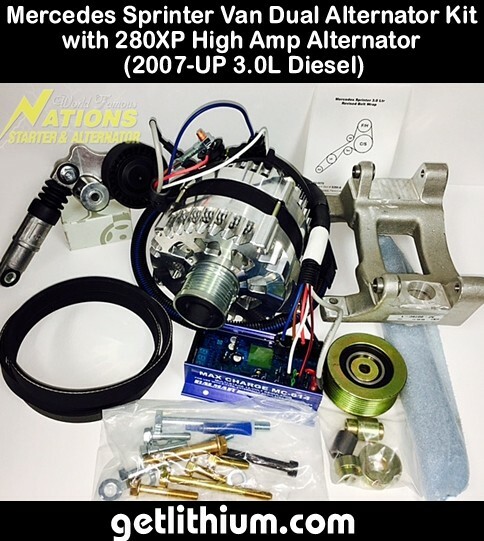 This kit allows you to use the existing alternator and OEM wiring for the truck's OEM power requirements and dedicate this second alternator to recharging things like a lithium-ion house battery system in the vehicle or in the RV trailer or camper. This is one of Nations Alternator's latest high output alternator upgrades for Ford F-150 Series trucks. 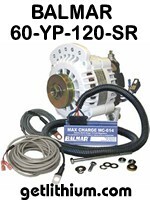 It outputs up to 300 Amps and is plug and play to replace the existing OEMalternator. We have 1 customer with a very lightly used alternator that has approx. 400 miles on it. He bought this alternator for his new 2017 Ford F-150 pickup truck but when he went to tow his big RV trailer from Colorado to Las Vegas he learned he needed the Ford F-350 truck. He is asking $500.00 USD or best offer. Please contact David with Pinnacle Innovations at 778-340-0060 or at siteinfo@shaw.ca and we can connect you with this customer. We offer the complete line of DC Power Solutions Custom Alternator products so if you don't see what you need, just call 778-340-0060 or email us. 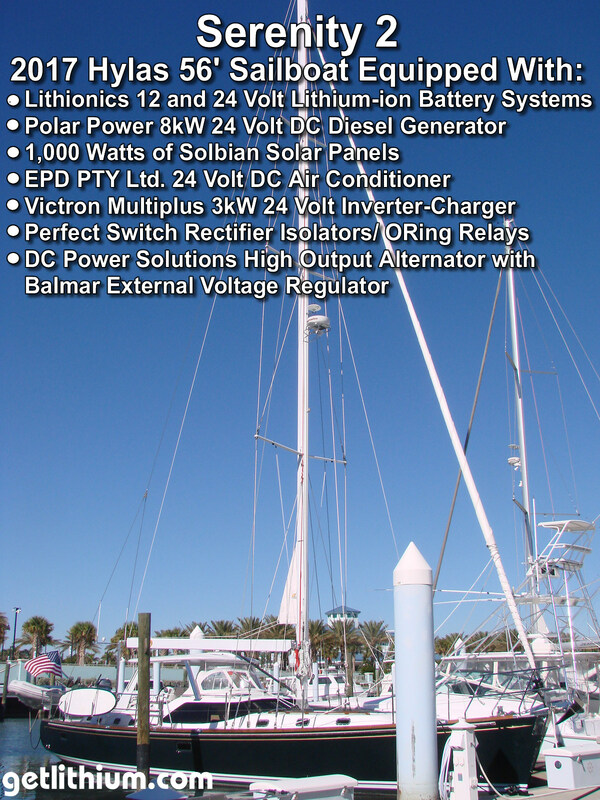 There are dozens of solutions to choose from for most popular marine/ yacht applications. Our 100, 120, 140, 160, 180, and 220 amp small frame marine alternators are available in a one-inch foot mount, two-inch foot mount, and 3.15" SADDLE mount configuration. 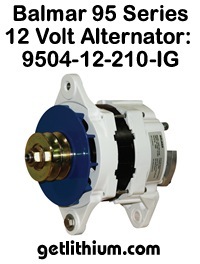 All alternators come with a 14.2 volt internal regulator, a D+ connection, and external field connections. NOW AVAILABLE WITH NEGATIVE FEED FIELD upon request. 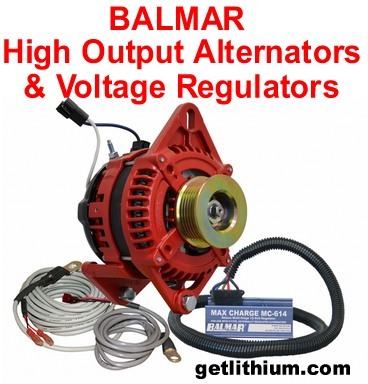 It is highly recommended that 160, 180, and 220 amp alternators are used with our remote rectifier for continuous high output, especially when used with lithium batteries. All alternators are built and tested in Eliot, Maine USA. Our 12 volt 250 Amp alternator is available in a J-180 mount and in a four point pad mount. 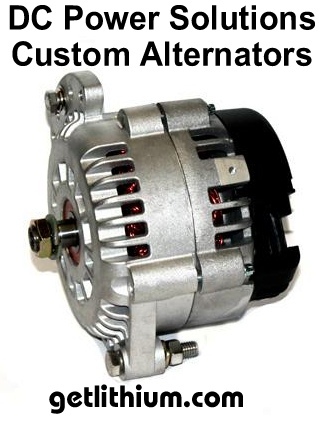 These alternators have oversized internals and externals. At idle this alternator will output 140 Amps! 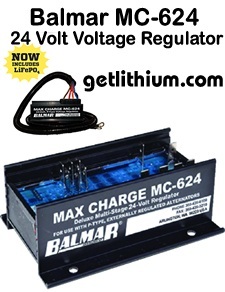 There is a 24 Volt model available that will output 85 Amps at idle and 110 Amps at full output. They can run all day at idle without any issue of overheating! All Stage Two alternators come with a 14.1 (28.2) Volt internal regulator, a D+ connection, and external field connections. NOW AVAILABLE WITH NEGATIVE FEED FIELD upon request. 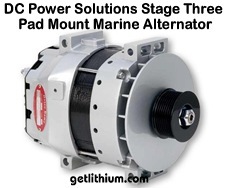 There are serpentine pulley kits for the most common marine engines available below to drive this alternator. 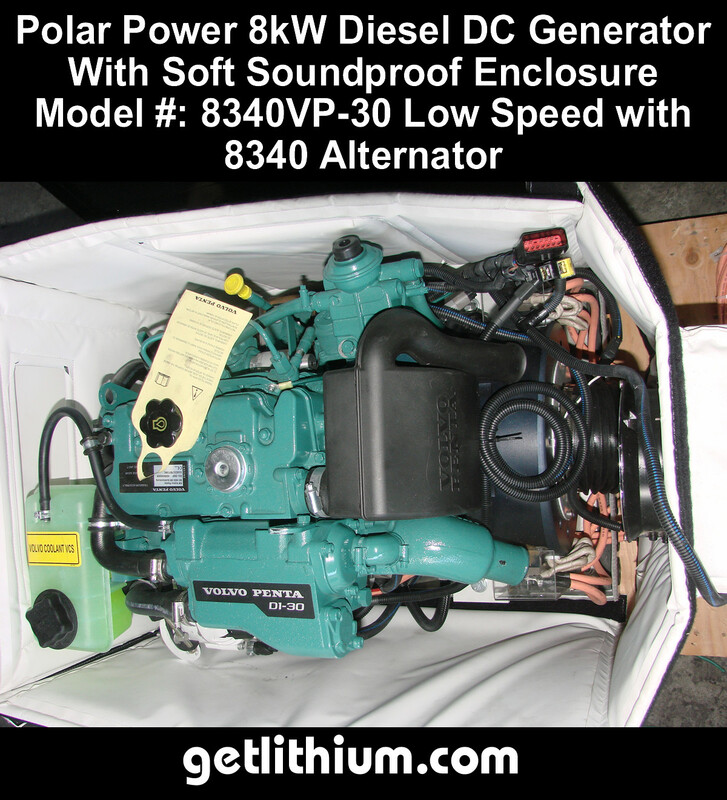 All alternators are constructed and tested in Eliot, Maine USA. 12 Volt 420 Amp, 24 Volt 250 Amp, and 24 Volt 275 Amp BRUSHLESS marine alternator comes with a three year limited warranty. Due to precise manufacturing and it's brushless design this alternator has an efficiency rating of 80%. One of the highest in the industry. 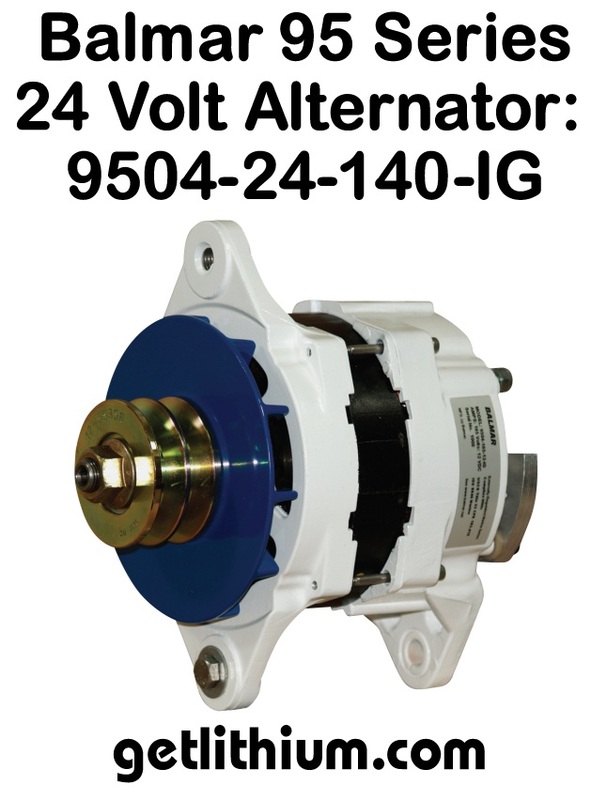 All alternators come with a 14.0 (28.0) Volt internal regulator, a D+ connection and external field connections. Due to the pad mount system this alternator needs to be fix mounted to the engine. Belt tension is then maintained by a mechanical spring loaded tensioner sold separately. 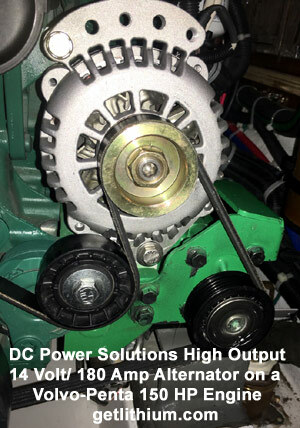 Additional DC Power Solutions products available including pulley/ serpentine belt kits and custom Voltage regulators. Contact us for more info 778-340-0060. 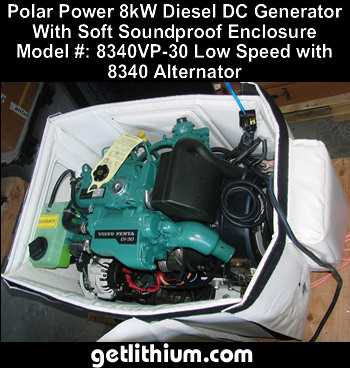 A powerful 12 Volt DC inverter-charger with 3,000 Watts continuous output at 120 Volts AC (6,000 Watts peak). 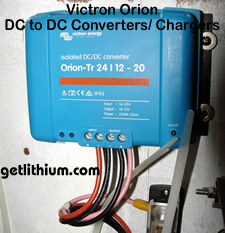 Powerful 150 Amp battery charger and separate AC Inputs/ Output. A key feature enhancement is 'Generator Support Mode' which enables the Freedom SW to supplement a generator when AC loads exceed the generator's capacity. The new generation models also feature improved AC transfer/AC input detection time, providing the ability to transfer AC loads to batteries in less than 10 milliseconds when the incoming grid or generator power is lost. Connected loads are almost unable to feel the power transition due to this quick transfer time. Unit dimensions: 13.5" x 15.25" x 7.75" tall. Weight: 73.7 pounds. Can be mounted flat (table top style) or vertically with the control buttons facing up. Simple and easy to install. See one installed on our Installations Page. 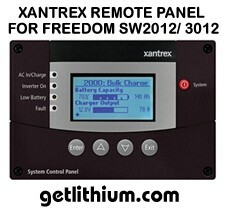 Also available in a 2,000 Watt model Fredom SW 2012. Both models are approved to UL458 with marine supplement, CSA, ABYC and FCC, Class B requirements. The Xantrex Fredom SW 2012 2,000 Watt inverter-charger also measures 13.5" x 15.25" x 7.75" tall. Can be mounted flat (table top style) or vertically with the control buttons facing up. 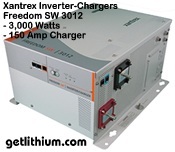 Parallel stacking enables the Freedom SW inverter/chargers to double the AC output in inverter mode. Series stacking enables the Freedom SW inverter/chargers to generate 120/240 V split phase output*. 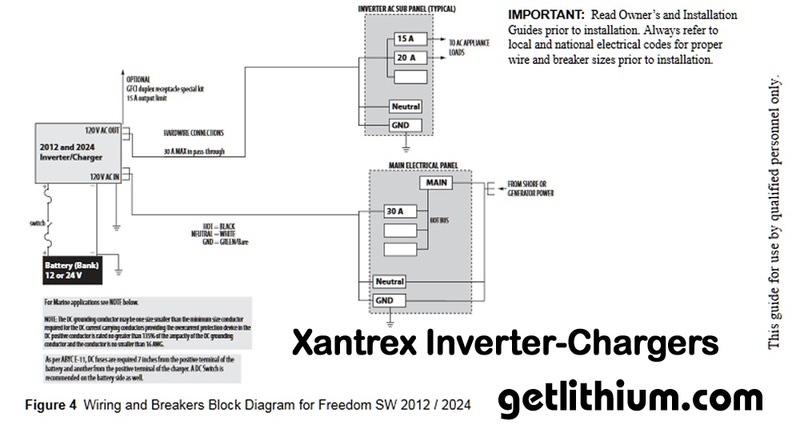 NOTE: We can only "stack" the exact same Xantrex models - we cannot stack say the SW3012 and the SW2012. 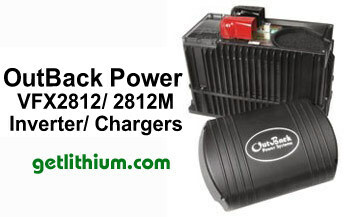 Also available direct from Pinnacle Innovations for non-Lithionics battery projects from $2,960.70 CAD. Featuring a graphical, backlit LCD screen, the System Control Panel (SCP) can monitor the Freedom SW Inverter/Charger and other devices connected to the Xanbus network. A powerful 12 Volt DC inverter-charger with 2,000 Watts continuous output at 120 Volts AC (4,000 Watts peak). 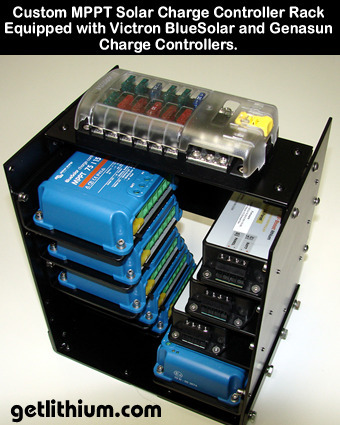 Powerful 100 Amp battery charger and separate AC Inputs/ Output. Unit dimensions: 13.5" x 15.25" x 7.75" tall. Weight: 60.5 pounds. Can be mounted flat (table top style) or vertically with the control buttons facing up. Simple and easy to install. 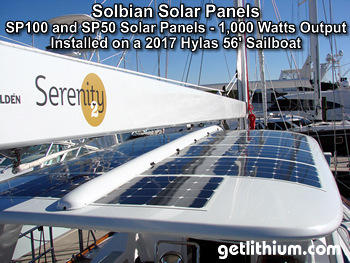 See the similar 3,000 Watt version installed on our Installations Page. Approved to UL458 with marine supplement, CSA, ABYC and FCC, Class B requirements. 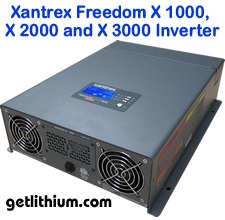 The Xantrex Fredom SW 2012 2,000 Watt inverter-charger measures 13.5" x 15.25" x 7.75" tall. Can be mounted flat (table top style) or vertically with the control buttons facing up. 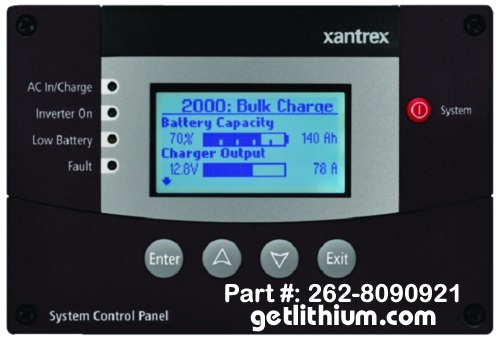 Price includes Xantrex System Control Panel plus 25' communication cable and Lithionics Factory Programming and Testing with your Lithionics Battery System. Add $30.00 USD for built-in GFCI outlet. 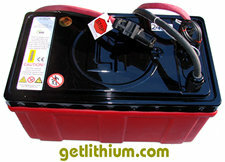 Also available direct from Pinnacle Innovations for non-Lithionics battery projects from $2,493.90 CAD. 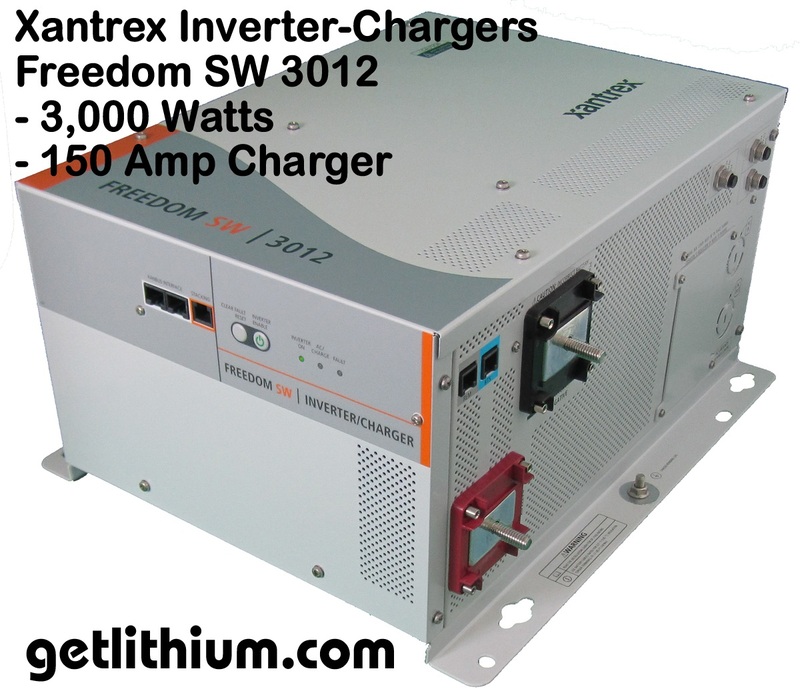 Photo below shows the 3,000 Watt version which looks the same as this 2,000 Watt inverter-charger. A great way to see what is going on with your inverter-charger - including what condition your input power is. 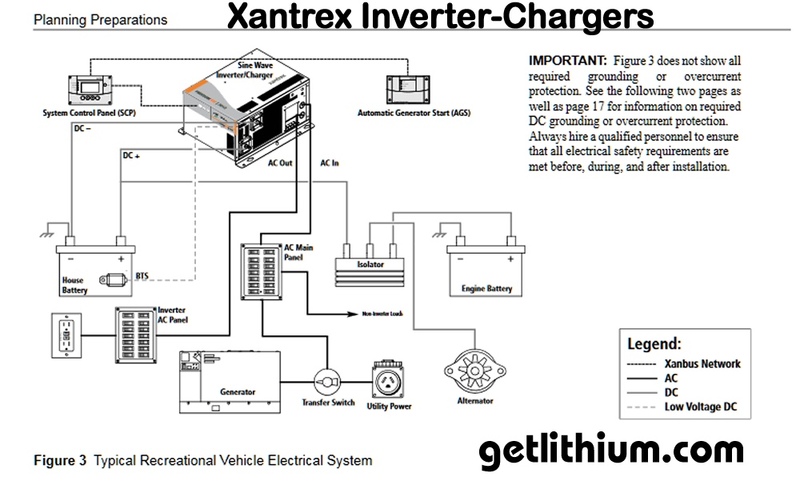 Requires Xantrex communications cable shown below to connect to Freedom Series 2012 and 3012 inverter-chargers. Display gauge measures 4" x 6" x 1 9/16" deep but you need to allow about 4" on the backside for the cabling. 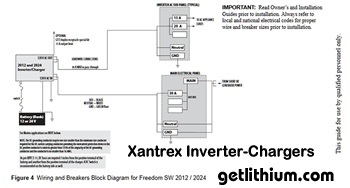 Required for Xantrex Freedom SW 3012 and SW 2012 supplied from Lithionics to connect the Inverter-charger to the remote display. 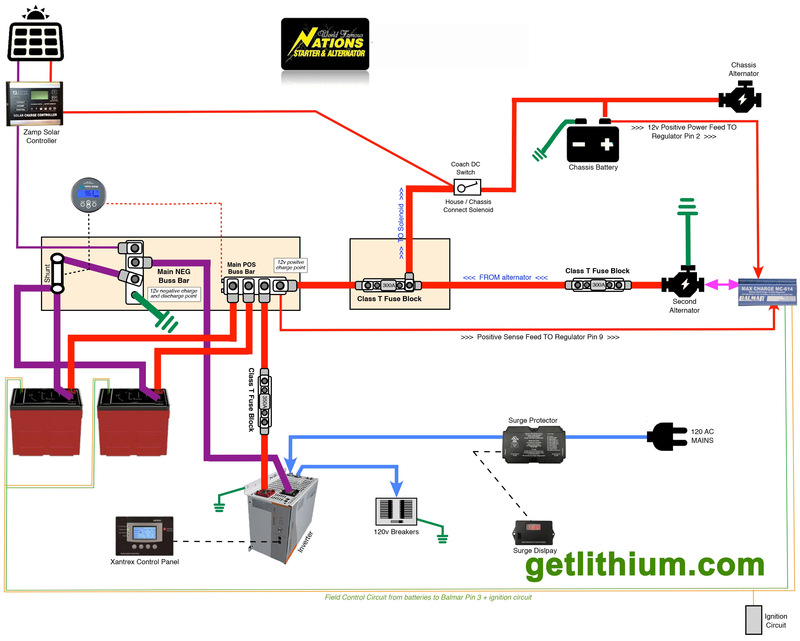 2,000 Watt True Sine Wave inverter, 4,000 Watts peak. It cranks out full output in invert or charge mode from -4 Fahrenheit to 104 Fahrenheit for operation in all climate temperatures. The extended surge rating of the Freedom XC makes it ideal to start difficult loads including fridge and microwave. The quick connect terminals at AC IN/OUT make installation a breeze. 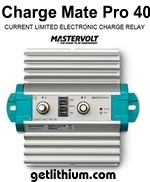 Charger: Programmable from 5 Amps to 80 Amps output. Ignition Control: Feature to turn inverter on/off via a 12 VDC signal and to minimize battery drain by switching the inverter off when the ignition key is turned off. 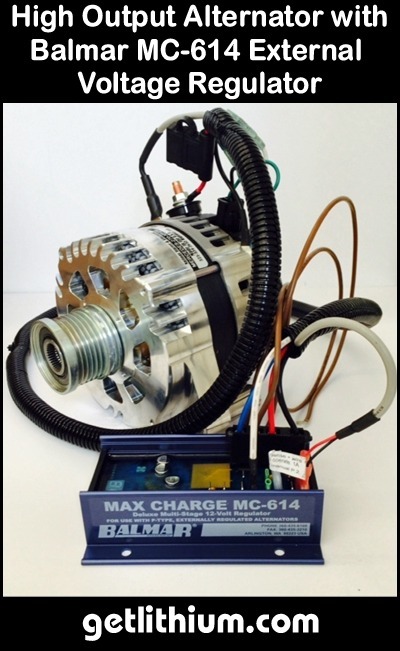 Wide 10-18 VDC Input Range: Ensures inverter operation on high voltage alternators found on many new vehicle chassis. User configurable Low Voltage Disconnect from 10.0 Volts to 12.8 Volts DC. Programmable AC Under-Voltage (85-110VAC) Shutdown: Feature ideal to operate under weak shore power or generator input. Built-in 30A AC Transfer Relay: Senses when outside AC Power is present and transfers the load from the inverter to the source of incoming power (shore or generator). The unit also automatically switches from invert mode to charge mode. NOTE: We do not recommend 2,000 Watt inverters for auxiliary airconditioners. Ships from Canada. Remote Panel 808-0817-01: $79.20 CAD. 25' Remote Panel Cable 31-6257-00: $24.90 CAD. 50' Remote Panel Cable 31-6257-00: $39.90 CAD. 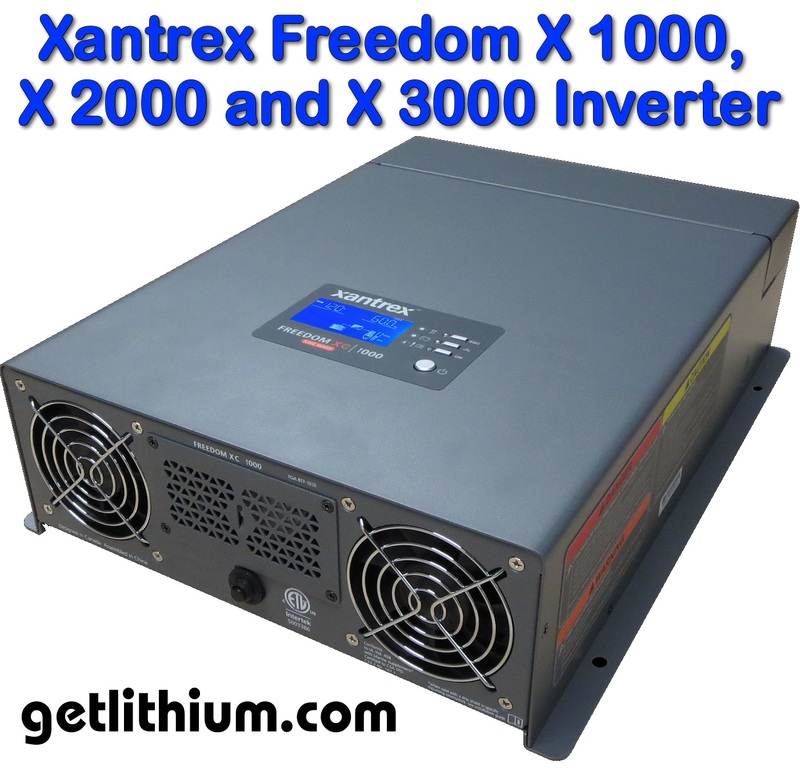 1,000 Watt True Sine Wave inverter, 2,000 Watts peak. It cranks out full output in invert or charge mode from -4 Fahrenheit to 104 Fahrenheit for operation in all climate temperatures. The extended surge rating of the Freedom XC makes it ideal to start difficult loads including fridge and microwave. 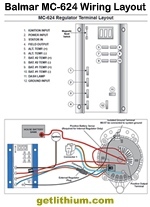 The quick connect terminals at AC IN/OUT make installation a breeze. 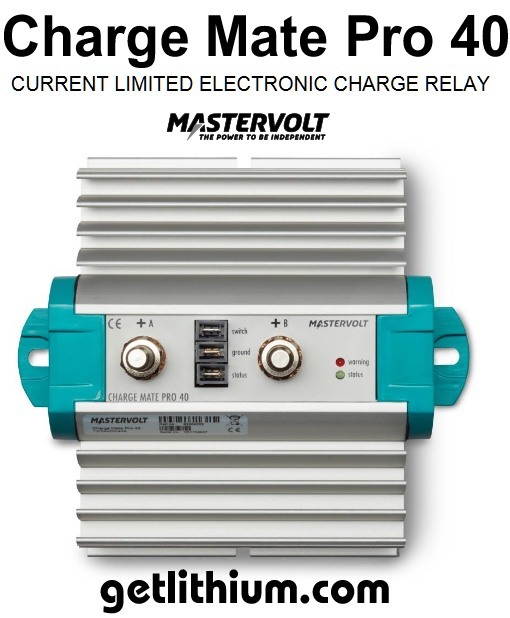 Charger: Programmable from 5 Amps to 50 Amps output. 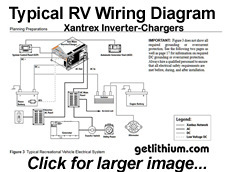 NOTE: We do not recommend 1,000 Watt inverters for auxillary airconditioners. Ships from Canada. 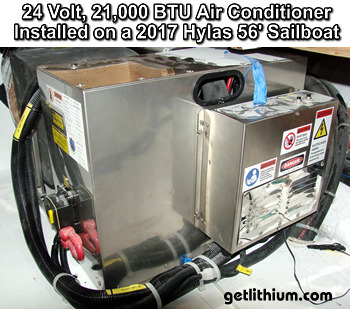 NOTE: We can also supply this from Lithionics direct with the lithium-ion battery firmware upgrades and tested with your battery system for $646.00 USD. 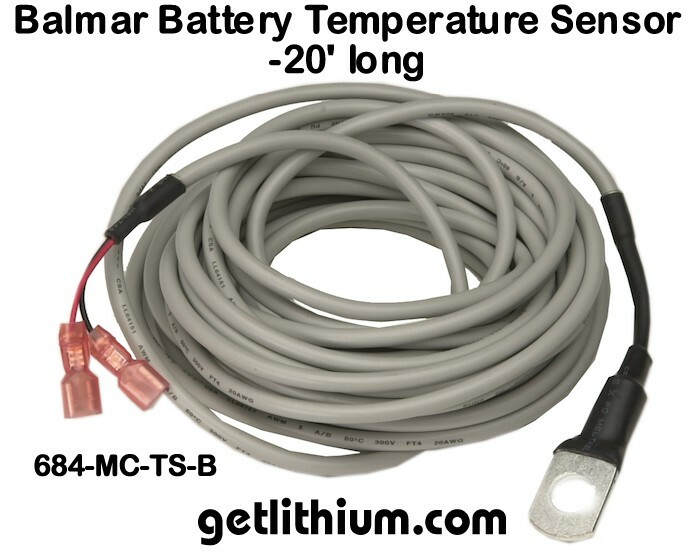 It would ship with your Lithionics Battery order from Clearwater, Florida. 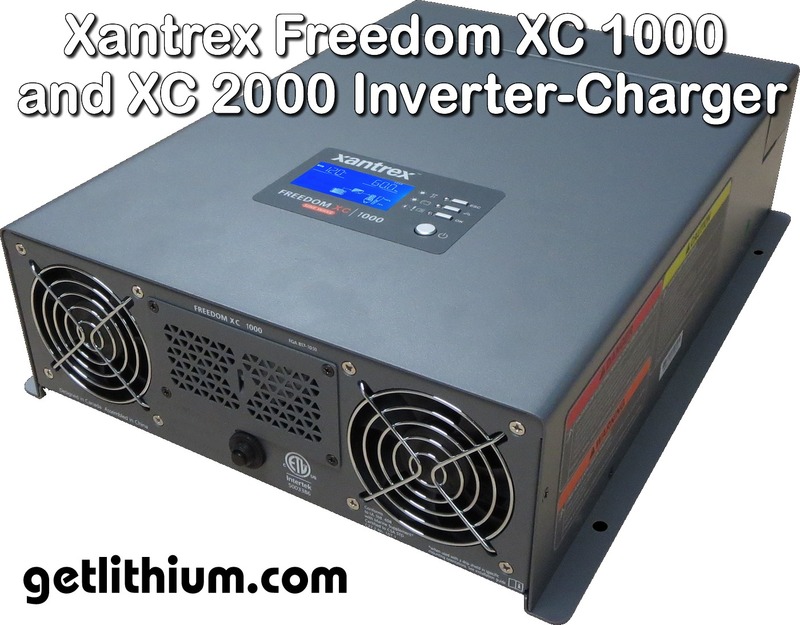 High quality, powerful 2,000 Watt inverter with 4,000 Watt 2 second peak power. View AC & battery current, % status bar for inverter output on the onboard display. No Charger - Inverter Only. 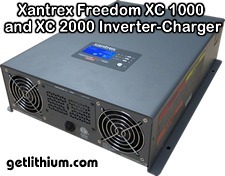 High quality, 1,000 Watt inverter with 2,000 Watt 2 second peak power. View AC & battery current, % status bar for inverter output on the onboard display. No Charger - Inverter Only. The compact, easy-to-use and easy-to-install design of the PROwatt SW Series makes it ideal for use in commercial truck, RV and marine applications. It also meets UL458 marine supplement. The PROwatt SW Series feature True Sine-Wave AC output with 540, 900 and 1800 continuous Watts respectively. With high surge capability, the PROwatt SW Series provides the necessary current to startup demanding electrical loads such as variable speed power tools, advanced electrical appliances, microwaves and much more. In addition to dual GFCI AC receptacles, the PROwatt SW Series include an innovative USB connection for providing power to most USB chargeable devices. 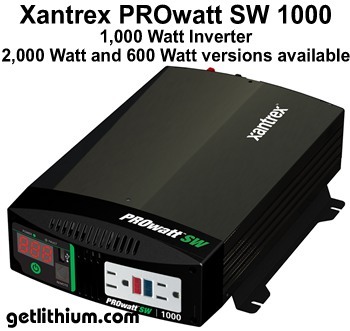 The PROwatt SW Series offers many safety features not found in similar inverters. 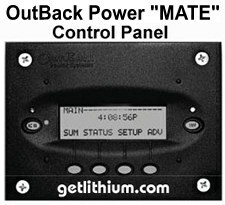 When equipped with a remote control, the PROwatt SW Series has the ability to provide automatic ignition lockout shutting down the inverter's output when the vehicle's ignition is not engaged. Power inverter providing AC power anywhere you need it. With True Sine-Wave output, the PROwatt SW Series can provide power for all types of electrical loads including, variable speed power tools, advanced electrical appliances, microwaves and much more. 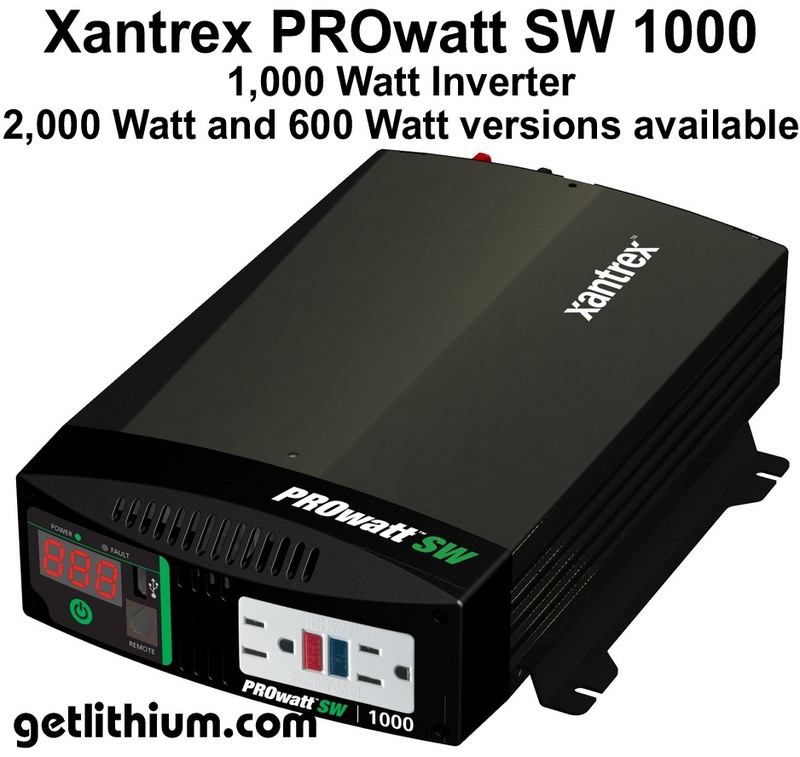 The PROwatt SW provides household AC power anywhere. Designed for recreational and industrial applications, expect the best performances from televisions, audio systems, variable speed tools, and any other electronics where you want nothing but the most optimal performance. 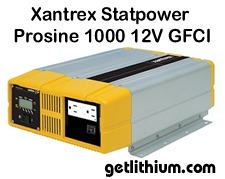 Offering superior quality true sine wave output, the Prosine 1000 and 1800 stand-alone power inverters are ideally suited for electrical systems that already have a quality multistage battery charger. Designed for recreational and industrial applications, their 120 Volt, 60 Hz AC power output is capable of handling both heavy duty and smaller, multiple AC loads. Prosine inverters include a backlit LCD display panel, which can be mounted remotely. Also available in a 2,000 Watt version for $2,079.90 CAD (Part numbers Xantrex 806-1800 or Xantrex 806-1802). Don't see the Schneider Electric/ Xantrex electrical product that you need? Just let us know what you are after and we can supply it. 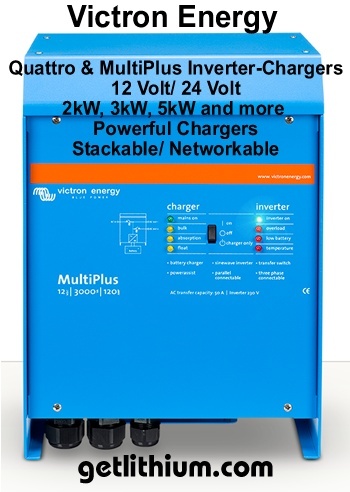 We have several installations successfully running Victron Energy electrical equipment including the Victron Quattro and Multiplus inverter chargers. 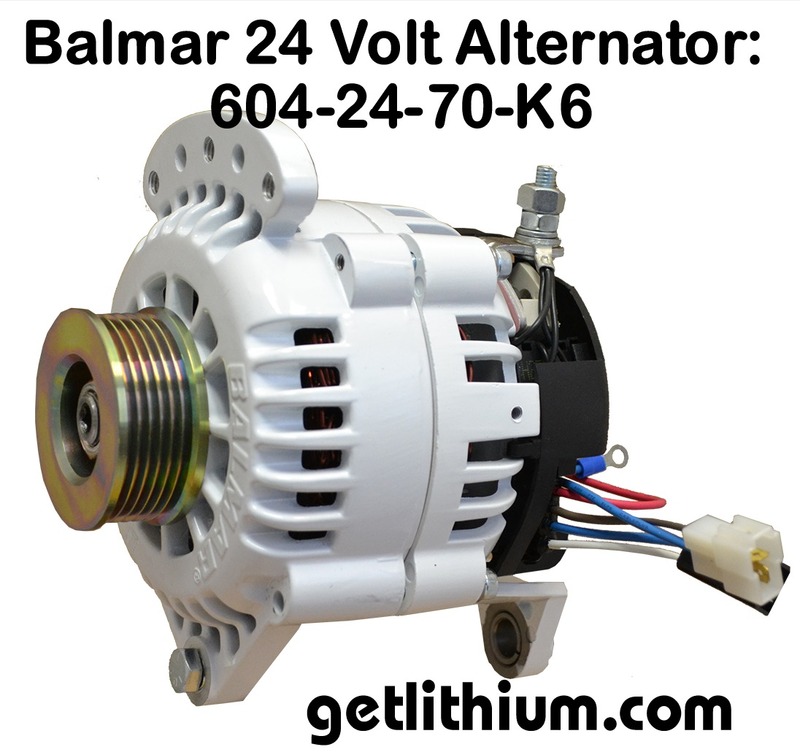 Available in 12, 24 and 48 Volt configurations. Victron offers a great selection of mid to high power inverter chargers that can be networked with other Victron equipment for seamless integration or as stand alone products. For more information on Victron Energy BlueSolar and SmartSolar MPPT Solar Charge Controllers, visit our solar controller page. We offer many more Victron Energy parts not shown here. Call Pinnacle Innovations at 778-340-0060 or email us at siteinfo@shaw.ca to obtain a quote. Don't see what you need here? We offer many more OutBack parts not shown here. Don't see what you need here? We offer many more Magnum Energy parts not shown here. In many cases we can provide on-site installations, supervision and consultation. Some of the locations that we have travelled to include Taiwan, Florida and other locations. 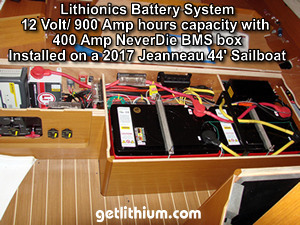 Above photo shows two Lithionics 12 Volt 450 Amp hour batteries in parallel connected to a 400 Amp NeverDie BMS box. As part of the installation here in Vancouver on this 2017 Jeanneau 44' sailboat, we also had to fabricate and install a preceision-fit custom aluminum battery box. 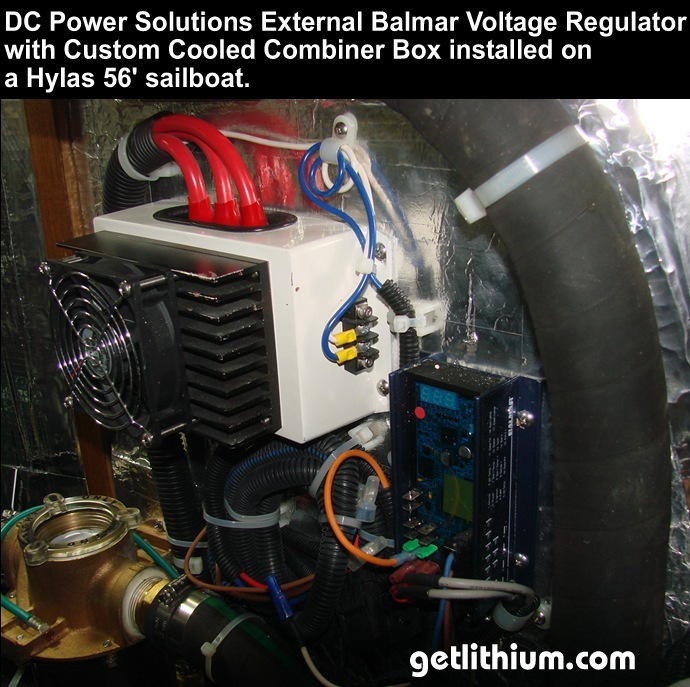 Installation photo of the DC Power Solutions 180 Amp 14 Volt high output alternator installed on a Hylas 56' sailboat.